The Armenian Genocide Museum-Institute will be closed from of December 27 till January 9, 2018. The Delegation led by the Deputy Minister of Foreign Affairs of the Republic of Greece Terens Nikolaos Quiq, visited the Armenian Genocide Memorial Complex, accompanied by RA Deputy Minister of Diaspora Vahagn Meliqyan. Acting Director of the AGM Gevorg Vardanyan introduced the guests with the history of the construction of the memorial complex. The members of delegation from Greece put flowers at the eternal fire and honored the memory of the innocent martyrs with a minute of silence. They also visited the Armenian Genocide Museum and were introduced with the museum exhibits, documentary proofs and photos about the Armenian Genocide. After the guided tour Deputy Minister of Foreign Affairs of the Republic of Greece also left a note in the Memory Book of Honorable Guests. What did the silent movie tell about Armenian Genocide? In 1915 a number of prominent Americans at the request of Henry Morgenthau, the US Ambassador to the Ottoman Empire, founded the Near East Relief Committee, which aimed вЂњto provide relief and to assist in the repatriation, rehabilitation, and the reestablishment of suffering and dependent people of the Near East and adjacent areas, as well as to provide for the care of orphans and widows вЂ¦вЂќ For the purpose of organizing donations and fundraising, the members of the Relief Committee began a large-scale campaign. 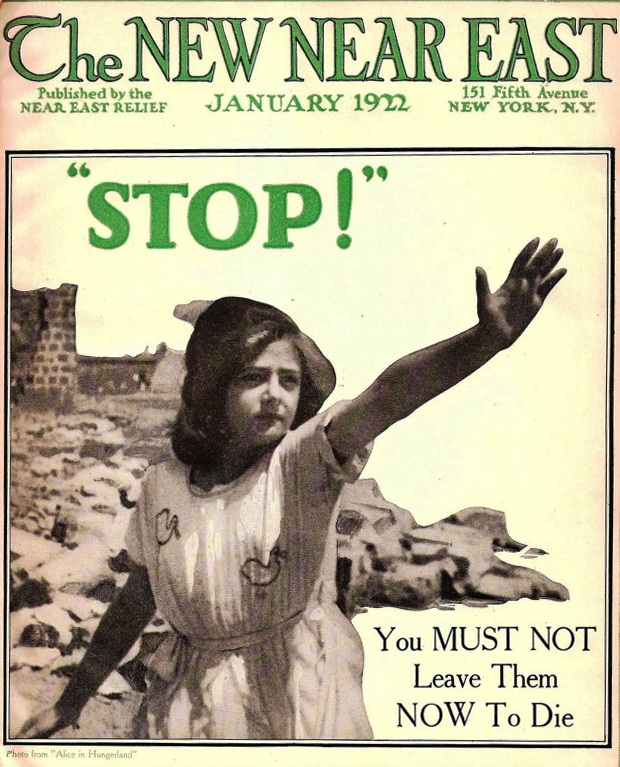 For more effective fundraising conditions were created at the end of World War I. It provided the broader layers of the society an opportunity better to understand the Near East tragedy through photographs and moving pictures. Using the power of visual image and realizing the impact of photographs of desperate Armenian refugees and orphans to capture the sentiments of the society, documentary and feature films were screened. In order to create such movies the Committee members, photographers, producers and filmmakers were sent to the Near East. In 1921, Mrs. Florence Spencer Duryea, as a member of the film crew of the Near East Relief Committee, arrived in Constantinople. Mrs. Florence Spencer Duryea was with the organization from the very first years of the Committee's creation, and was particularly interested in Armenian refugees and orphans. Being the National Director of WomenвЂ™s Organizations for the institution, she frequently spoke about Near East ReliefвЂ™s work and was quoted in prominent publications such as the New York Times and the Woman Citizen. 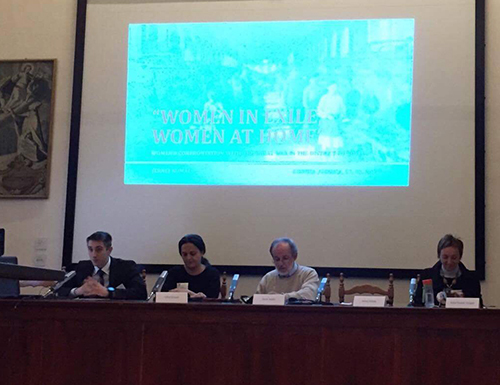 On November 16-17, AGMI senior researcher Edita Gzoyan participated at the international conference "Women and World War I" organized by the Department of History and Faculty of Arts, University of Ljubljana and Museum of Great War in Gorizia, Italy. The conference was held in Ljubljana (Slovenia) and Gorizia (Italy) with nearly 20 speakers from Slovenia, Slovakia, Italy, Germany, Austria, Ukraine, UK, USA, Israel, Turkey and Armenia. Dr. Edita Gzoyan has presented a paper titled "Reclamation of Armenian Women and Girls after the Armenian Genocide: Neutral House in Constantinople". 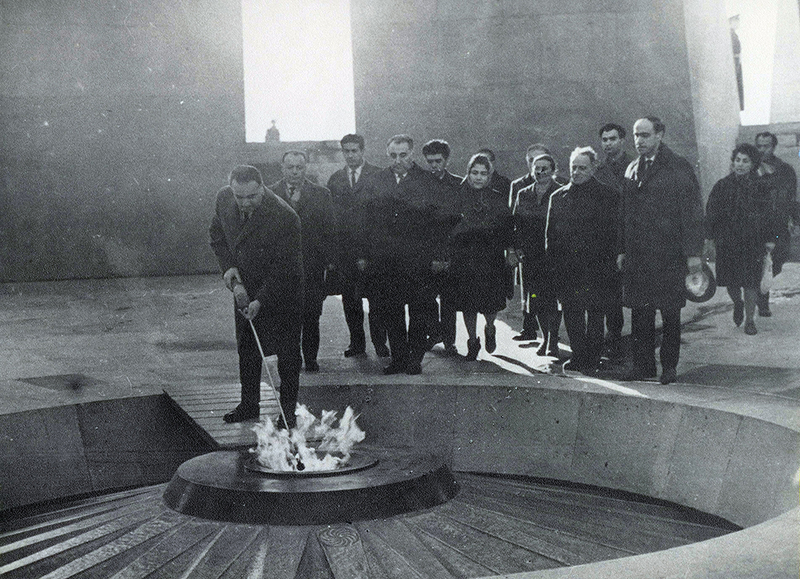 50 years ago this day, on November 29, 1967, Memorial dedicated to the victims of the Armenian Genocide was solemnly opened on the hill of Tsitsernakaberd. The Armenian Genocide Memorial is fairly considered as the most important and most impressive among many other similar monuments. This is a unique monument uniting the Armenian nation. In 1965, on the 50th anniversary of the Armenian Genocide, after a long forced silence for the first time the victims of the Armenian Genocide were commemorated at the state level in Soviet Armenia. One of the main initiators of those commemorative events and the construction of the memorial complex was the first secretary of the Central Committee of the Communist Party of Armenia Yakov Zarobyan (1908-1980). In 1960 he became the first secretary of the Central Committee of the Communist Party of Armenia and as a patriotic figure he not only assured high economic growth and development, but also by breaking of communist-party ideological chains, carried out nationwide programs, seemingly impossible for that time, such as strengthening ties with Diaspora, organizing events on the 50th Anniversary of the Armenian Genocide, constructing the Genocide Memorial, etc. Johannes Ehmann was born in November 20, 1870, in Wurtmberg, Germany. He got pedagogical and psychological education. After 1894-1896 Hamidian massacres of Armenians in the Ottoman Empire, a pro-Armenian movement was emerging In Germany the foundation of the German Union of Assistance to Armenia was established (July, 1896). 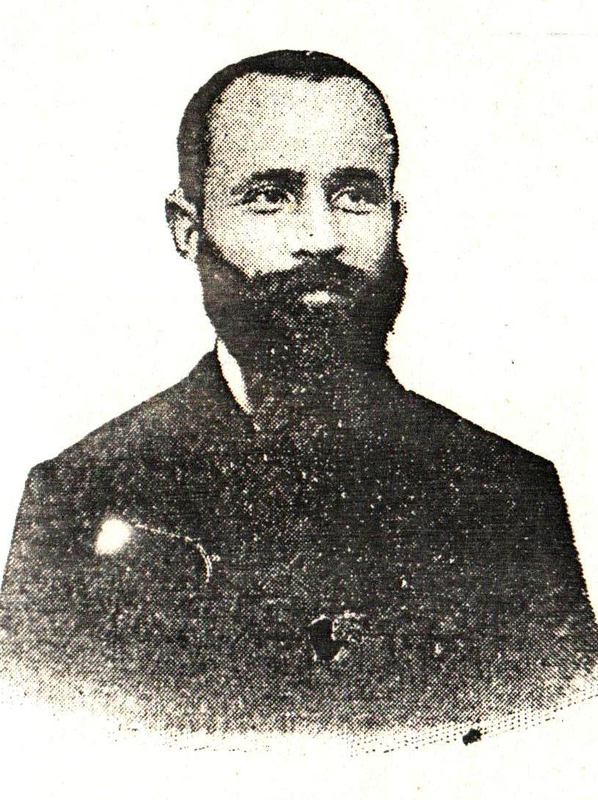 As one of the first representatives of the foundation, teacher Johannes Ehmann , doctor Herle, and agronomist Max Zimmer went to the Ottoman Empire at the end of 1896. At the beginning of 1897 the first German missionaries arrived in Turkey. Teacher Ehmann founded a center for his missionary activity in Mezre, which was located 5km south-west of Kharberd, and was the administrative center of Kharberd province in 1878. In 1914, the population of Mezre reached 16,000, half being Armenians. In Mezre, Ehmann rented two buildings to start his missionary activity. 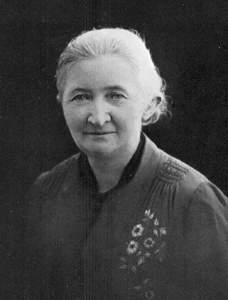 As a skilled pedagogue, Ehmann understood that, in order to communicate with the local population, to recognize the morals and customs of Armenians, it is necessary to learn Armenian. So he started to learn Armenian from Professor Melqon who was a teacher at the Euphrates College, and graduated from the Basel (Switzerland) missionary school. After the Hamidian massacres, there were many Armenian orphans in the Ottoman Empire, the care and upbringing of which was undertaken by foreign missionaries (American, Swiss, German and more). So, he immediately undertook orphansвЂ™ gathering activities. Boleslav Pirshtuk, Deputy Chairman of the House of Representatives of the National Assembly of the Republic of Belarus and Co-Chair of the Inter-Parliamentary Cooperation Committee between the National Assembly of Armenia and Belarus, and the members of the Commission visited the Armenian Genocide Memorial Complex accompanied by Eduard Sharmazanov, Deputy Speaker of the National Assembly of Armenia and Co-Chair of the Inter-Parliamentary Committee. The guests put flowers at the eternal fire and honored the memory of the innocent martyrs with a minute of silence. 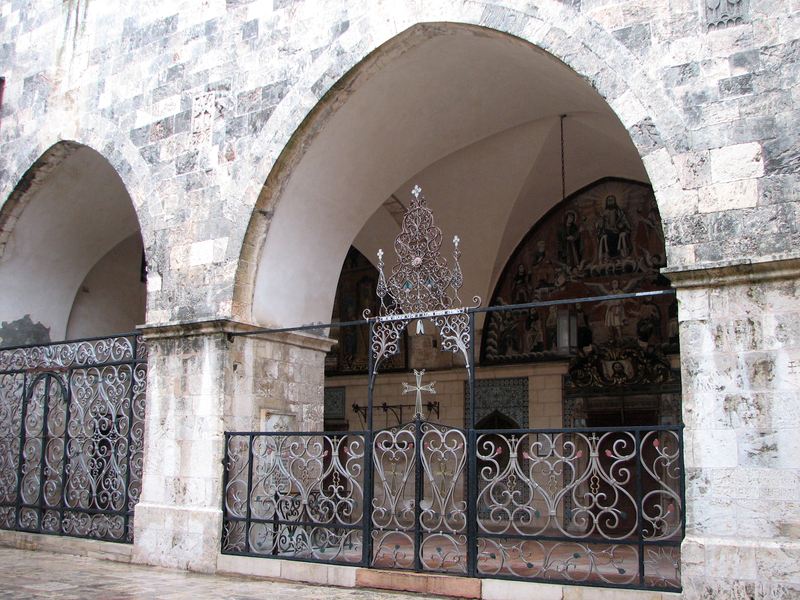 With the aim to study the documents related to the history of the Armenian Question and the Armenian Genocide kept at the Armenian Patriarchate of Jerusalem, Robert Tatoyan, the senior researcher at the Armenian Genocide Museum-Institute, made a duty journey to Jerusalem on November 6-16, 2017. After the signing of the Treaty of Lausanne in 1923, the British and French troops left Constantinople to the Kemalists. Archbishop Zaven Eghiayan, the Constantinople Armenian Patriarch, was forced to leave Turkey too. He took with him some documents related to the Armenian Patriarchate 1912-1922 activity. Archbishop Zaven archives finally came to Jerusalem, where they kept up to now. 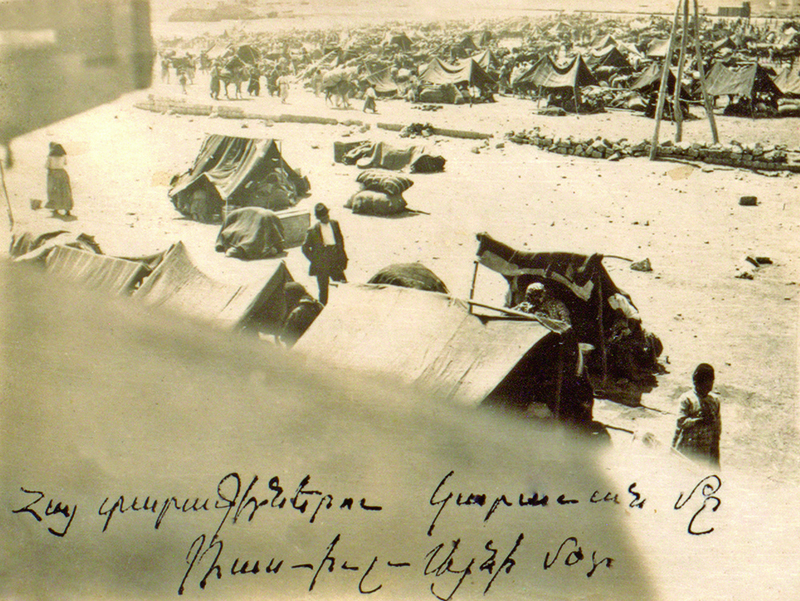 The archive contains documents concerning various aspects of the Armenian question and the Armenian Genocide, particularly on negotiations around the Armenian Question on the eve and immediately after the end of the First World War, on the number of Western Armenians in 1912-1922, on the identity of the Turkish criminals responsible for the implementation of the Armenian genocide, on the Armenian Patriarchate orphan care activity, on the treatment of the Western Armenians in 1919-1922, etc. The majority of the archbishop Zaven archives documents are not in the scientific circulation at present. 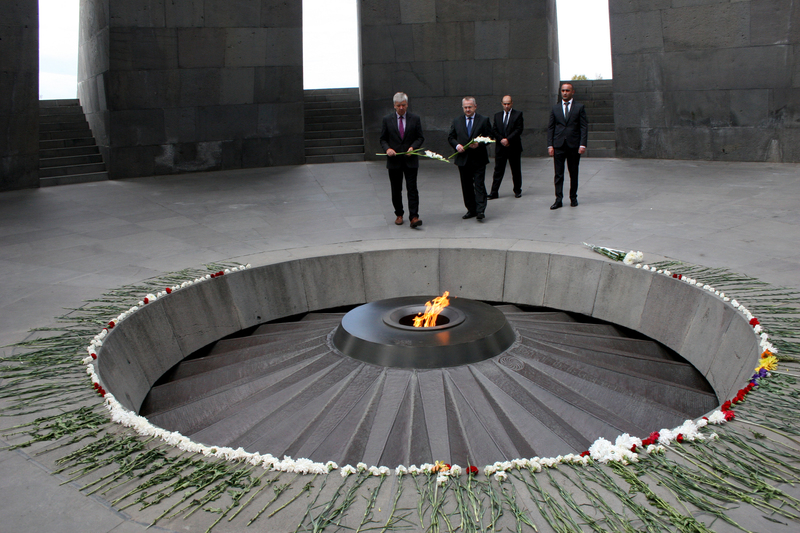 By invitation of Eduard Nalbandyan, Minister of Foreign Affairs of the Republic of Armenia, Sergey Lavrov, Minister of Foreign Affairs of the Russian Federation, who is on the official visit to Armenia, visited the Armenian Genocide Memorial Complex. High ranking guests were accompanied by Shavarsh Kocharyan, RA Deputy Minister of Foreign Affairs, and Ivan Volnikin, Russian Ambassador Extraordinary and Plenipotentiary to the Republic of Armenia. AGMI acting director Gevorg Vardanyan introduced the history of the construction of the memorial complex, as well as explained the symbolism of the monument to the guests. 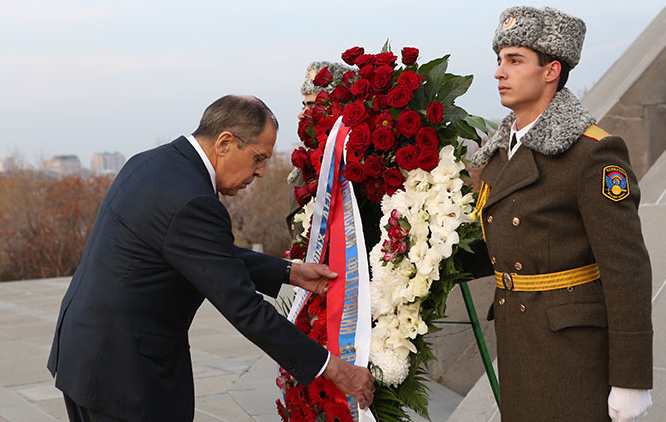 Sergey Lavrov laid a wreath at the Genocide Monument, and put flowers at the eternal fire, by honoring the memory of the innocent martyrs with a minute of silence. Tony Fadell, the laureate of RA 2017 Presidential Award for Global Contribution in the Field of IT, the founder of вЂњNest LabsвЂќ company, originator of "IPod" and "IPhone" trademarks and Tony Moroy, the General Manager and Chairman of вЂњViasphere International,вЂќ co-founder and president of the conference of Armtech, visited the Armenian Genocide Museum and Memorial. The guests put flowers at the eternal fire and honored the memory of the innocent martyrs with a minute of silence. Gevorg Vardanyan, the acting director of AGMI, presented the history of the construction of the memorial complex, as well as explained the symbolism of the monument to the guests. The guests also visited the Armenian Genocide Museum and get acquainted with the museum exhibits, documentary proofs and photos of the Armenian Genocide. The guests left a note in the Memory Book of Honorable Guests of the museum. Aloysio Nunes Ferreira, Minister of Foreign Affairs of Brazil, visited the Armenian Genocide Memorial Complex accompanied by David Ohanyan, Deputy Mayor of Yerevan, and AGMI acting director Gevorg Vardanyan. Aloysio Nunes Ferreira Ferreira laid a wreath at the Genocide Monument, and together with the members of the Brazilian delegation put flowers at the eternal fire and honored the memory of the innocent martyrs with a minute of silence. Gevorg Vardanyan introduced the guests with the history of the construction of the memorial complex. Minister of Foreign Affairs of Brazil also visited the Armenian Genocide Museum and was introduced with the museum exhibits, documentary proofs and photos about the Armenian Genocide. He also left a note in the Memory Book of Honorable Guests. On November 16, the chairman of the Senate of Netherlands Anki Brukers-Knoll, who is on an official visit to Armenia, visited the Armenian Genocide Memorial Complex accompanied by Arpine Hovhannisyan, Vice President of the RA National Assembly, and Dzyunik Aghajanyan, Ambassador Extraordinary and Plenipotentiary of the Republic of Armenia to the Kingdom of Netherlands. The chairman of Senate laid a wreath at the Genocide Monument and put flowers at the eternal fire, honoring the memory of the innocent martyrs with a minute of silence. High ranking guests also visited the Armenian Genocide Museum and were introduced to the museum exhibits, documentary proofs and photos of the Armenian Genocide. They left a note in the Memory Book of Honorable Guests. On November 11, Ashot Ghulyan, Chairman of the National Assembly of Artsakh Republic, and the members of Parliament visited the Armenian Genocide Memorial Complex accompanied by AGMI acting director Gevorg Vardanyan. The members of the delegation put flowers at the eternal fire and honored the memory of the innocent martyrs with a minute of silence. 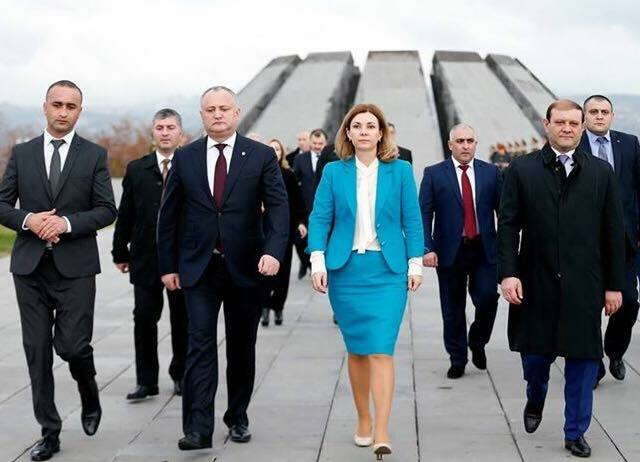 Today the President of the Republic of Moldova Igor Dodon, who is on an official visit to Armenia by the invitation of the President of the Republic of Armenia Serzh Sargsyan, visited the Armenian Genocide Memorial Complex with his wife accompanied by Yerevan Mayor Taron Margaryan. 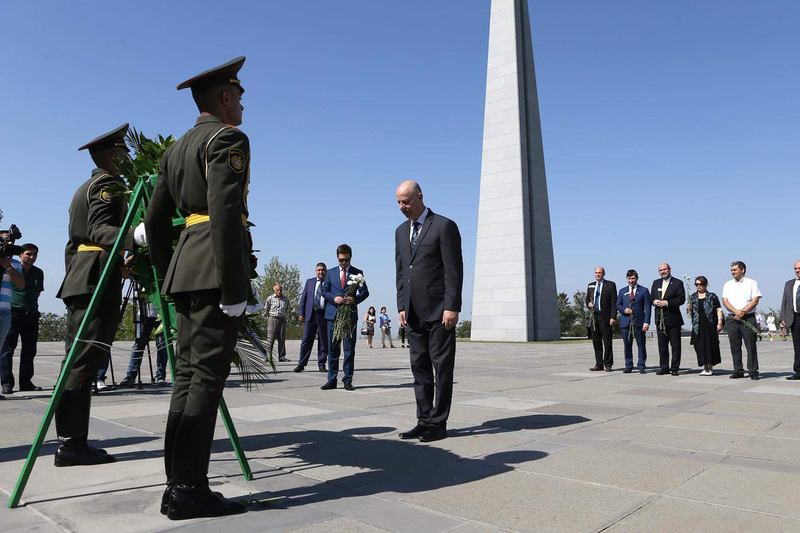 President of the Republic of Moldova laid a wreath at the Genocide Monument, and the members of the delegation put flowers at the eternal fire and honored the memory of the innocent martyrs with a minute of silence. President Igor Dodon and the members of his delegation also visited the Armenian Genocide Museum and were introduced to the museum exhibits, documentary proofs and photos of the Armenian Genocide. After the guided-tour President of the Republic of Moldova left a note in the Memory Book of Honorable Guests. The Armenian Genocide Museum-Institute announces 2018 LEMKIN SCHOLARSHIP program for foreign students and PhD candidates. Raphael Lemkin scholarship is intended to enable foreign students and young scientists, who specialize in genocide studies, especially in the Armenian Genocide, to visit Armenia for a month to conduct research in local scientific institutions and libraries. The deadline for application is on 15 December, 2017. The winner will be selected by the Scientific Council of the AGMI on 25 December, 2017. The delegation headed by Gudrun Mosler-TГ¶rnstrГ¶m, chairman of the Congress of Local and Territorial Authorities of the Council of Europe, accompanied by Vatche Terteryan, Deputy Minister of Territorial Administration and Development, visited the Armenian Genocide Memorial Complex. Ms Gudrun laid a wreath at the Memorial to the innocent victims of Armenian Genocide. The members of delegation put flowers at the eternal fire and honored the memory of the innocent martyrs with a minute of silence. 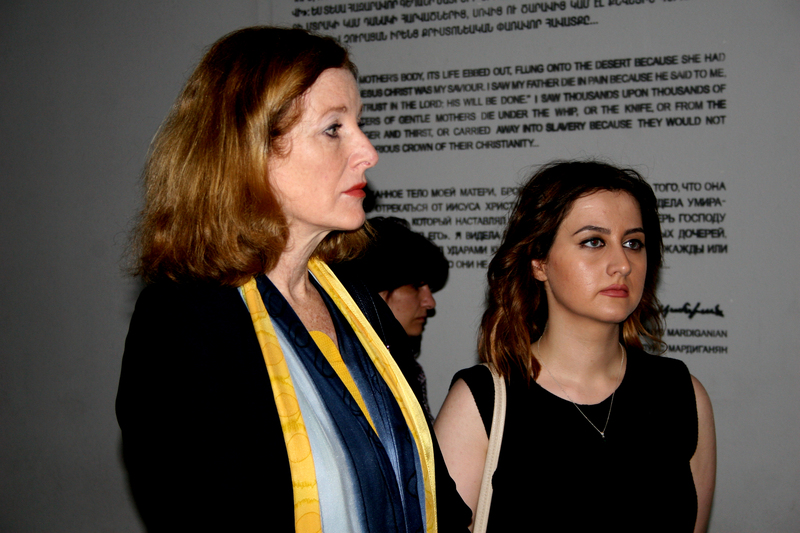 The delegation headed by Ms Gudrun also attended Armenian Genocide Museum and got acquainted with the documentations concerning Armenian Genocide, and watched the museum exhibits. 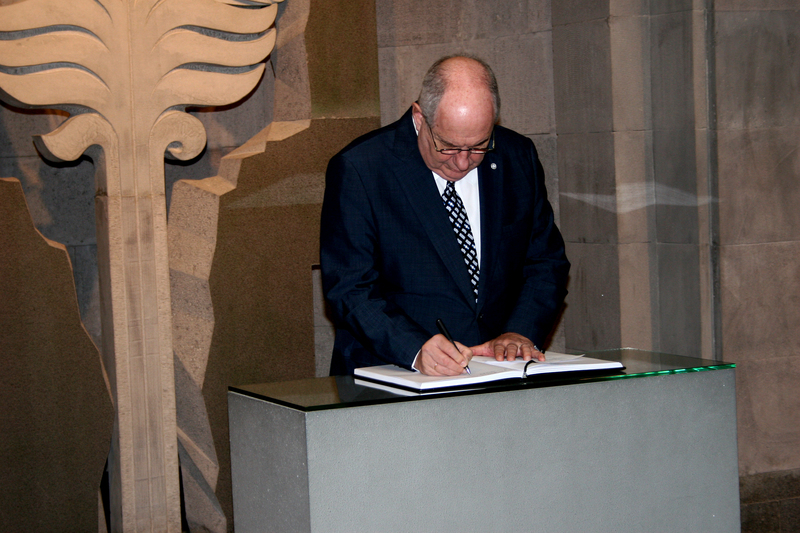 After the guided-tour the chairman of the Congress of Local and Territorial Authorities of the Council of Europe left a note in the Memory Book of Honorable Guests. On November 2, Nikolai Ryzhkov, co-chair of the Commission on Cooperation between the Federal Assembly of the Russian Federation and the National Assembly of the Republic of Armenia, Member of the Federal Council of the Russian Federation, the members of commission, accompanied by Artashes Geghamyan, co-chair of the Armenian-Russian Inter-Parliamentary Cooperation Committee, and Volodya Badalyan, former deputy of Armenian National Assembly, visited the Armenian Genocide Memorial Complex. Nikolai Ryzhkov and Russian parliamentarians put flowers at the eternal fire and honored the memory of the innocent martyrs with a minute of silence. Nikolai Ryzhkov emphasized that every delegation visiting Armenia should come to this sacred place of Armenian people. More than 100 years have passed since the first massacres of Western Armenians. Abdul Hamid rule has left unspeakable consequences on the life of Armenians and also has prepared a base for the implementation of 1915 Armenian genocide. About 300.000 Armenians were killed during the massacres. Parallel to the massacres of Western Armenians, their cultural heritage, mostly schools and churches, was ruined and destroyed. Armenians has also suffered huge material loss. These events were greatly echoed in the local and world media. Apart from the articles, a number of photos, caricatures of the Turkish perpetrators, especially of Sultan Abdul Hamid II, post cards, etc. have appeared in the European press of the time. Insert-postcards for advertising purposes were also popular. 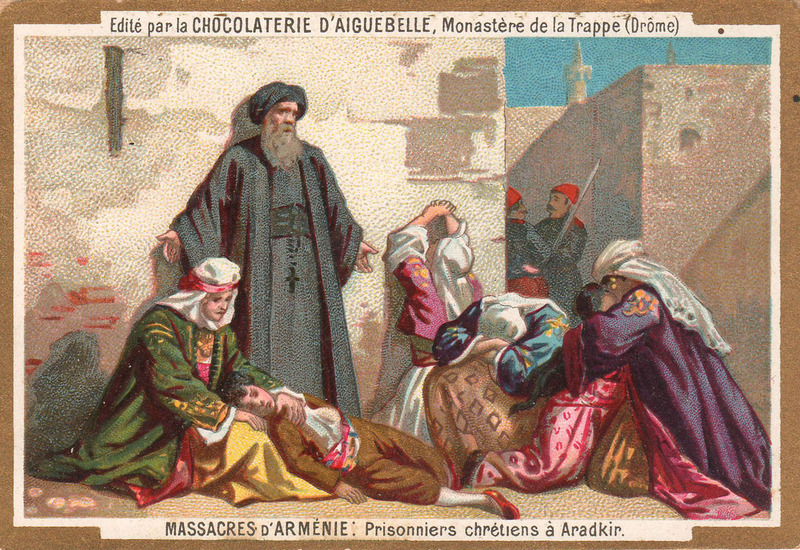 In 1896 the French chocolate-making В«Chocolaterie dвЂ™AiguebelleВ» company released a series of promotional postcards under the heading вЂњArmenian MassacresвЂќ (В«Massacres dвЂ™ArmГ©nieВ») dedicated to 1894-1896 Armenian massacres in the Ottoman Empire. On October 31, three ombudsmen of the Human Rights Institution of Bosnia and Herzegovina and the accompanying stuff visited Armenian Genocide Memorial Complex headed by Arman Tatoyan, RA Human Rights Defender. The members of delegation put flowers at the eternal fire and honored the memory of the innocent martyrs with a minute of silence. The delegation of ombudsmen also visited the Armenian Genocide Museum and was introduced to the museum exhibits and history of Armenian Genocide. Afterwards, members of the delegation left a note in the Memory Book of Honorable Guests. Udo Michallik, Secretary General of the Standing Conference of the Ministers of Education and Cultural Affairs of the Lander in the Federal Republic of Germany (StГ¤ndige Konferenz der Kultusminister der LГ¤nder in der Bundesrepublik Deutschland), who arrived in Yerevan on an official visit, visited Armenian Genocide Memorial Complex. AGMI acting director Gevorg Vardanyan accompanied the delegation from Germany. Udo Michallik and his colleagues visited also the Armenian Genocide Museum and were introduced to the museum exhibits, documentary proofs and photos about Armenian Genocide. 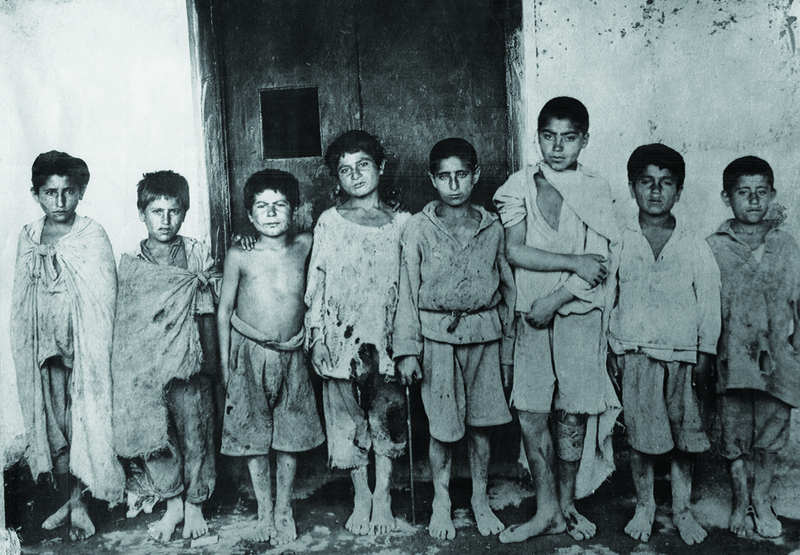 During the Armenian Genocide tens of thousands of Armenian refugees, many of them orphans, were settled in Eastern Armenia, mainly in the province of Yerevan, to escape the Turkish and Kurdish violence and secure safe residence. In January 1915, eight orphanages were opened in Yerevan, and till October this number reached 37, with 2690 sheltered children. Those orphanages were operating under the care and supervision of various charitable organizations and committees. 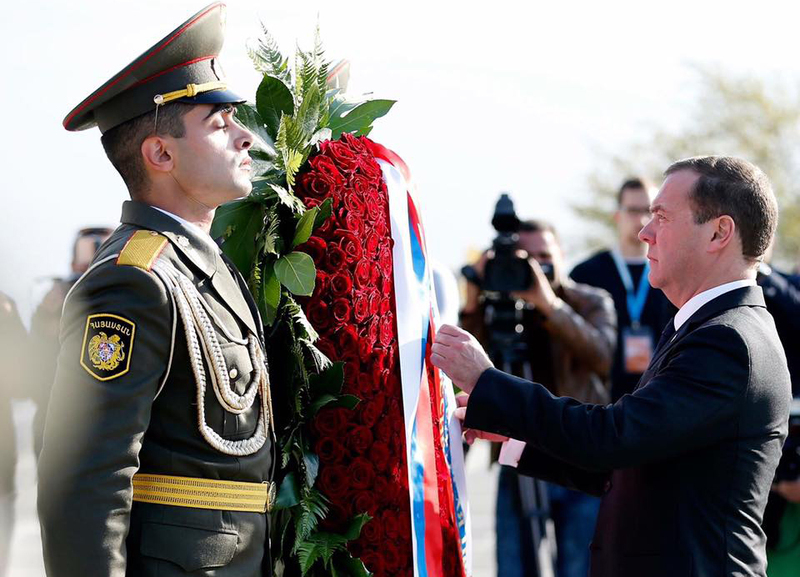 Prime Minister of the Russian Federation Dmitry Medvedev, who arrived in the Republic of Armenia on an official visit paid a tribute at the Armenian Genocide Memorial Complex and laid a wreath at the memorial to the innocent victims of the Armenian Genocide accompanied by Yerevan Mayor Taron Margaryan and RA Deputy Prime Minister Vache Gabrielyan. Russian Prime Minister and members of his delegation put flowers at the eternal fire and honored the memory of the innocent martyrs with a minute of silence. Secretary of the Armenian Genocide Museum-Institute Gevorg Vardanyan introduced the honorable guests to the history of construction of the Armenian Genocide Memorial. RF Prime Minister also made a tour of the Memory Alley and watered the fir planted during his previous visits. 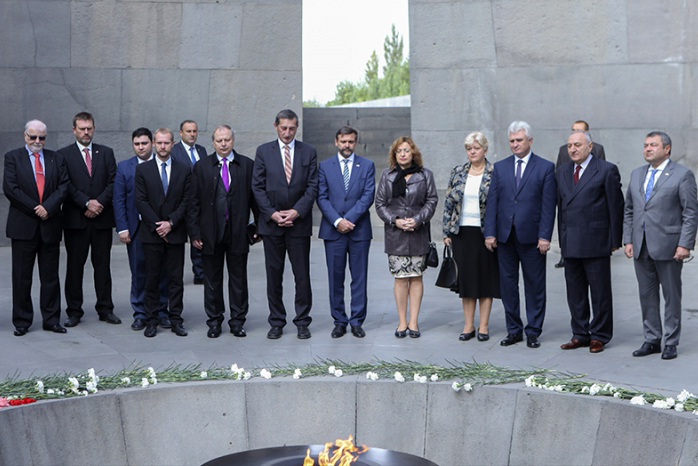 On October 22, Mexican deputies Blanca Margarita Cuata Dominguez, Maria Cristina Teresa Garcia Bravo and Carlos HernГЎndez MirГіn visited Tsitsernakaberd Memorial Complex accompanied by Eduard Sharmazanov Deputy Speaker of the RA National Assembly and Margarit Yesayan, deputy of the RA National Assembly. Mexican deputies laid flowers at the eternal fire and honored the memory of the innocent martyrs with a minute of silence. The guests also visited Armenian Genocide Museum and were introduced to the historical facts, details and testimonies related to Armenian Genocide. At the end of their visit the Mexican deputies left a note in the memory book of Honorable Guests. On October 15-18, AGMI Deputy Director Suren Manukyan participated at the annual conference of the International Committee of Memorial Museums in Remembrance of the Victims of Public Crimes (ICMEMO) of the International Council of Museums (ICOM) in Cincinnati (Ohio, USA). He delivered a speech titled В«Memorialization of Armenian Genocide, Memory: Memorial, Museum and Centennial. During the years of Armenian genocide many foreign diplomats, soldiers, missionaries, travellers in the Ottoman Empire have witnessed deportation and annihilation of Armenians living in the Ottoman Empire. Their memories contain valuable information about the policy of the Turkish authorities against Western Armenians and organization of deportations and mass killings. One of these eyewitnesses was a Persian prose writer Mohammad Ali Jamalzadeh. Sayyed Mohammad-Ali Jamalzadeh was born in 1892 in Esfahan, in the family of an Islamic preacher. 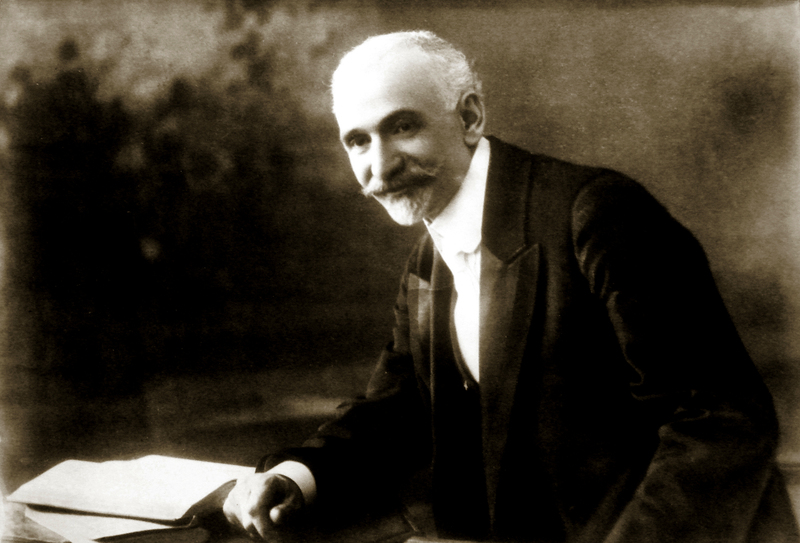 For attending French school he moved to Beirut (1908), then France ( 1910) and Switzerland, where he studied law at University of Lausanne and later at University of Burgundy in Dijon, France, where he received a Ph.D. in law. 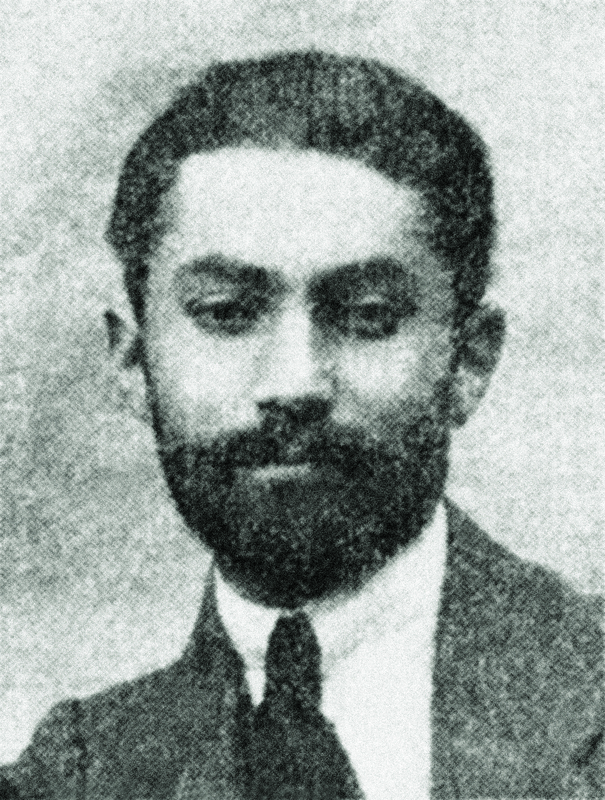 During 1915-1930 he lived in Berlin, where he worked for a Persian periodical published in Berlin, for a while he worked in the Iranian Embassy, was a member of The Union of Persian Nationalists in Germany, and in 1915 he founded the periodical of the Union. When British troops approached Baghdad, with two Swedish officers Jamalzadeh returned to Europe through Baghdad and Aleppo. His way was through Turkey, where he witnessed the terrible massacres of the Armenians by the Ottoman Government. About the tragic situation of caravans of displaced Armenians Jamalzadeh speaks in the book titled вЂњSargozasht va Qare JamalzadeвЂќ (JamalzadehвЂ™s life and work). Some years later, in 1917, he again referred to the events in an essay titled вЂњMoshahedate shakssie man dar djange djahanie avvalвЂќ (My personal reflections during the years of World War 1) published in Geneva. In his memories Jamalzadeh confirms, that his evidences are real, and he has personally witnessed the events. вЂњIn the evening I got to a village, where I stopped in an unpleasant cafГ©. And there, from that very moment I witnessed a number of cruel tortures of the Armenians by Turkish soldiers during the first years of World War One. As you may know the consequence was massacre of millions of ArmeniansвЂќ. AGMI acting director Suren Manukyan participated at the international conference вЂњThe Armenian Genocide; History, Remembrance, ResponsibilityвЂќ held in Bucharest, on October 13-15. He delivered a speech titled вЂњUnchangeable nature of Ottoman Armenians' sacrifice on the eve of Armenian Genocide". The conference was organized by the вЂњArmenian UnityвЂќ of Romania, В«Orbis TertiusВ» association, В«Lepsiushouse PodstamВ» Institute, the city Museum of Bucharest and the Embassy of Armenia in Romania. Among the main initiators of the conference were Sorin Antokhi, Romanian historian and author of a number of articles and editorials on the Armenian Genocide, and Petros Khorasanjyan, Romanian Armenian writer-publicist, columnist in a popular magazine. Newly appointed Ambassador Extraordinary Plenipotentiary of the French Republic to the Republic of Armenia Jonathan LacГґte and his colleagues visited the Armenian Genocide Memorial Complex. They put flowers at the eternal fire and honored the memory of the innocent martyrs with a minute of silence. The Ambassador visited also the Armenian Genocide Museum, where he was introduced to the documentary concerning Armenian genocide. After the guided tour around the museum Jonathan LacГґte left a note in the Memory Book of Honorable Guests. IvГЎn GaztaГ±aga is political scientist and M.D in International Law and International Relations (University of Granada) and expert in Middle East Studies (Hebrew University of Jerusalem) and now is completing his Ph.D in International, European and Comparative Law focused on Armenian Genocide with the following topic: вЂњThe Genocide against the Armenian people in the diplomatic and consular letters (1914-1925)вЂќ. - Ivan, the program is coming to an end, have you done all your research? - I am completing my PhD in International Law and Genocide Studies at the University of Granada (Spain). 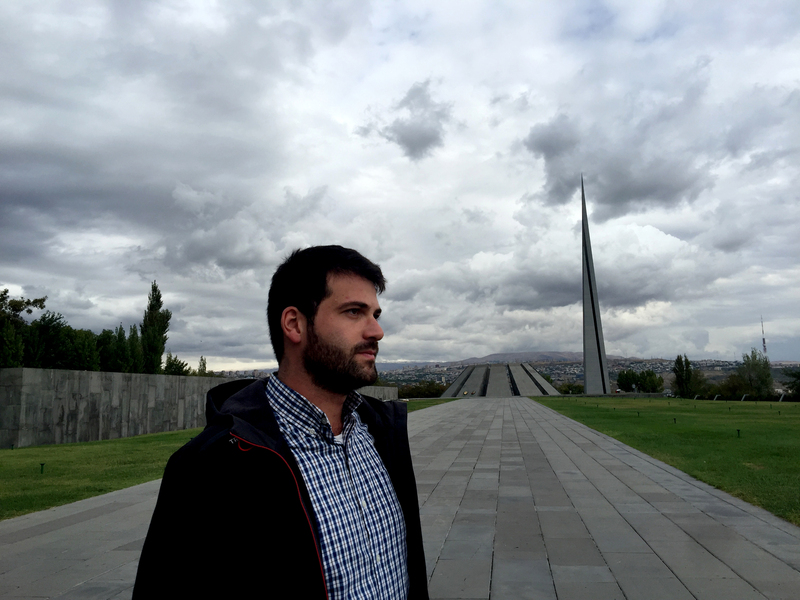 My research experience in Armenia was a part of comparative resources, comparative frameworks, diverse point of views and theories regarding Armenian Genocide. In AGMI, I was advised and directed by the historian Robert Tatoyan, who provided me with the basic and general literature, as well as detailed investigations in different fields: statistics, history, political science, journalism and art. Hollywood legend, actor, director, screenwriter and producer John Malkovich visited Armenian Genocide Museum accompanied by Sergey Smbatyan, the principal conductor and director of the State Youth Orchestra of Armenia. Lusine Abrahamyan, the Deputy Director of AGMI presented in details the history of Armenian Genocide to the famous guest. After the tour John Malkovich left a note in the Memory Book of Honorable Guests. 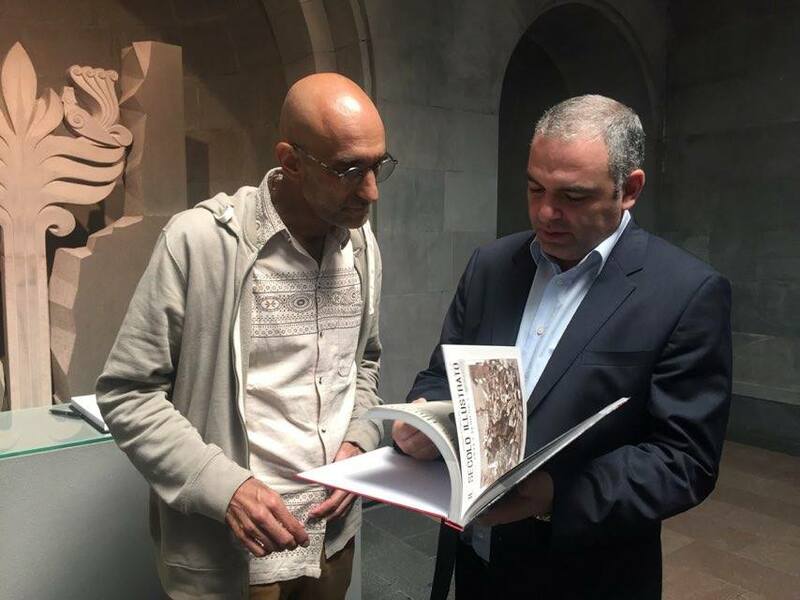 AGMI Acting Director Suren Manukyan presented the Hollywood actor Hayk DemoyanвЂ™s book вЂњThe Coverage of the Armenian Genocide on the Front Pages of the World PressвЂќ, and another one authored by Hayk Demoyan and Lusine Abrahamyan вЂњAuroraвЂ™s Road. Odyssey of Armenian Genocide SurvivorвЂќ. 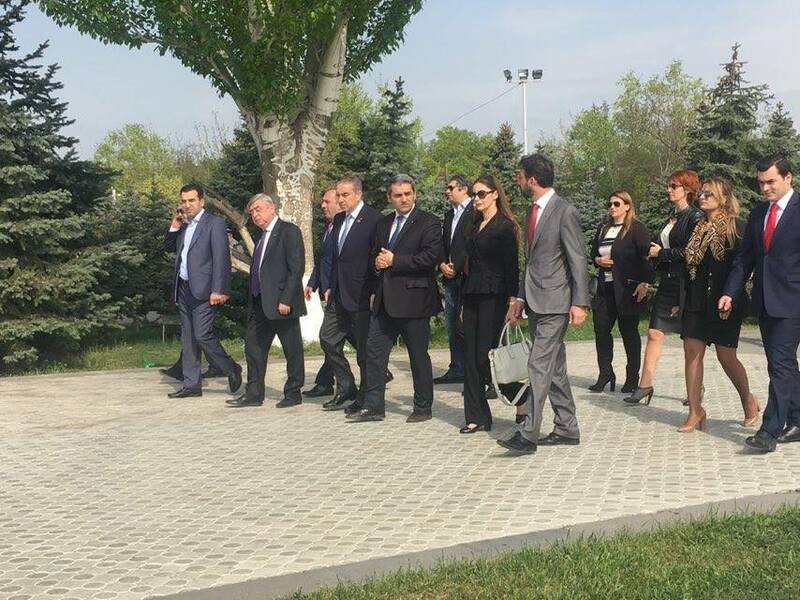 After that AGMI Acting Director Suren Manukyan accompanied the actor to the Armenian Genocide Memorial Complex. The photo is of a Norwegian polar explorer, great humanist Fridtjof Nansen. In 1925, during his visit to Soviet Armenia he got acquainted with the conditions of orphans' care in one of the orphanages in Alexandrapol. 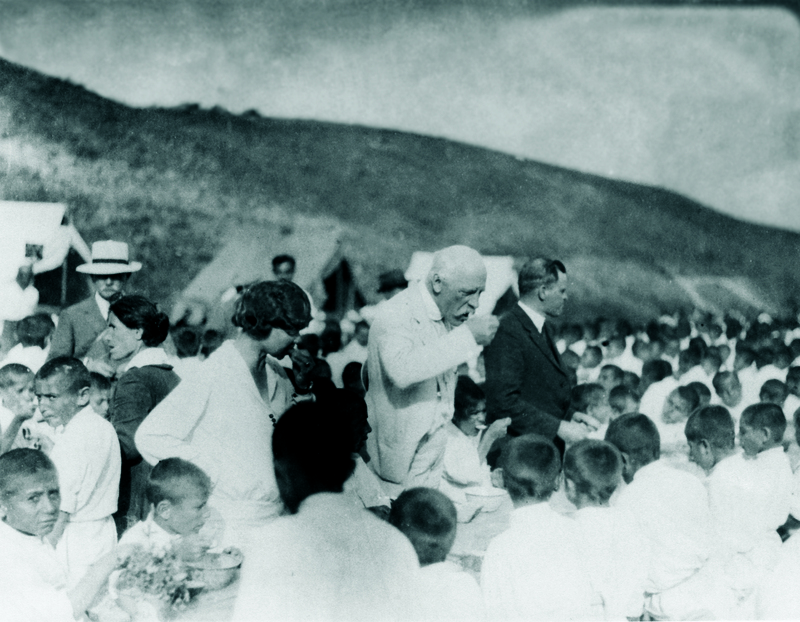 It is dinner time: Nansen did not hesitate and ate the soup that was intended for children in order to have an idea about the quality of the food. This was a vivid proof that Nansen was very serious and caring in his mission. Pro-Armenian work had a special place in the activities of Fridtjof Nansen. He made vigorous efforts to improve the conditions of Armenian deportees. As High Commissioner of the League of Nations in 1925, he visited Soviet Armenia to study on the spot the issue of settling and creating tolerable conditions for the Armenian deportees. Milan Е tД›ch laid a wreath at the Genocide Monument and the guests put flowers at the eternal fire. They honored the memory of the innocent martyrs with a minute of silence. The members of the Czech delegation visited also the Armenian Genocide Museum-Institute, got acquainted with the documents proving the Armenian Genocide. 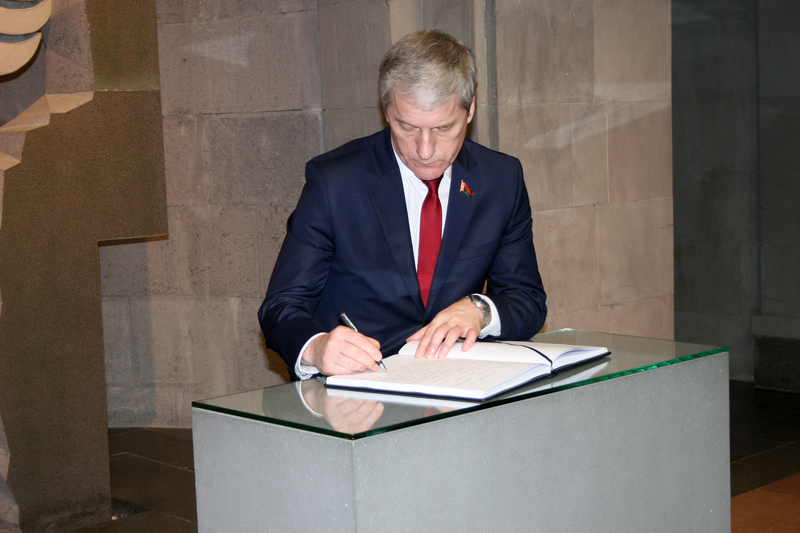 After the tour Milan Е tД›ch, the President of the Senate of the Parliament of the Czech Republic, left a note in the Memory Book of Honorable Guests. 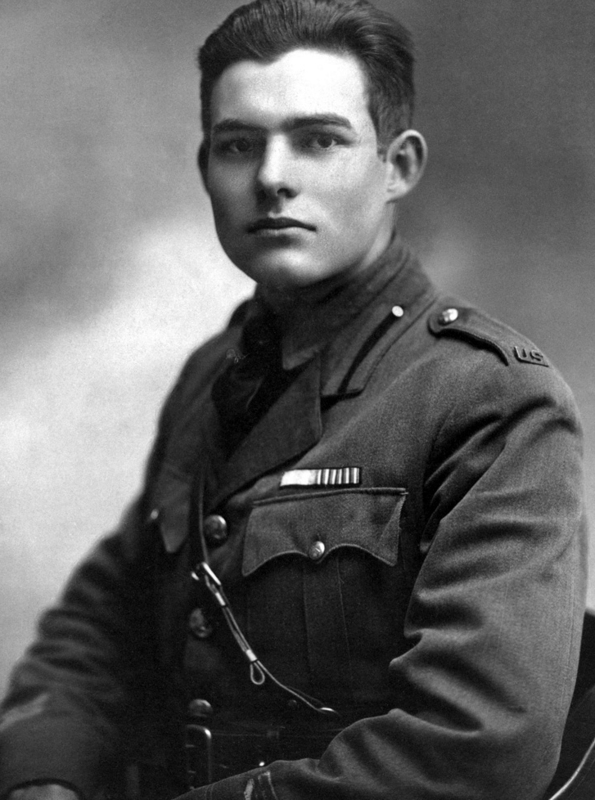 During the years of World War I American writer Ernest Hemingway left for Europe, took part in the War and was seriously injured. In September 1922 by assignment of the Canadian вЂњToronto Daily StarвЂќ newspaperвЂ™s editorial office, Hemingway left for Turkey as a reporter. In September 1922 the Kemalist troops organized a real carnage in Smyrna, setting on fire the Armenian and Greek quarters. The aim was to terrorize the Christian population of the city and made them to leave it. The districts were covered with the corpses of Armenians and Greeks. Those, who tried to survive and be saved by Italian, British and American worship witnessing the fire, were sunk in the sea. The author was shocked by the atrocities organized by the Turkish government, sufferings of Armenians and Greeks living in Smyrna. In a short Story collection вЂњIn our TimeвЂќ printed in 1925, in a short story called вЂњOn the Quai at SmyrnaвЂќ, where Hemingway wrote. 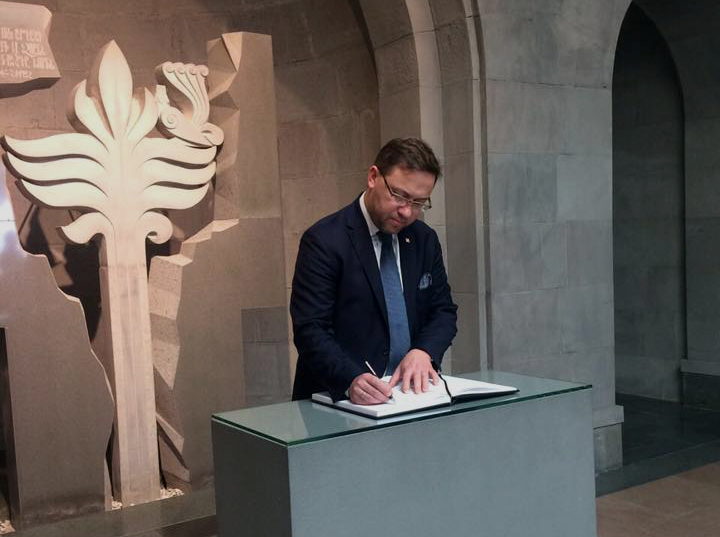 Deputy Foreign Affairs Minister of the Republic of Poland Bartosh Tschichotski and his delegation visited the Armenian Genocide Memorial Complex. The guests from Poland put flowers at the eternal fire and honored the memory of the innocent martyrs with a minute of silence. The delegation from Poland had a guided tour in the museum and was introduced to the history of Armenian Genocide. Afterwards Bartosh Tschichotski left a note in the Memory Book of Honorable Guests. Participants of the вЂњArmenia-DiasporaвЂќ conference honored the memory of the Armenian Genocide victims. 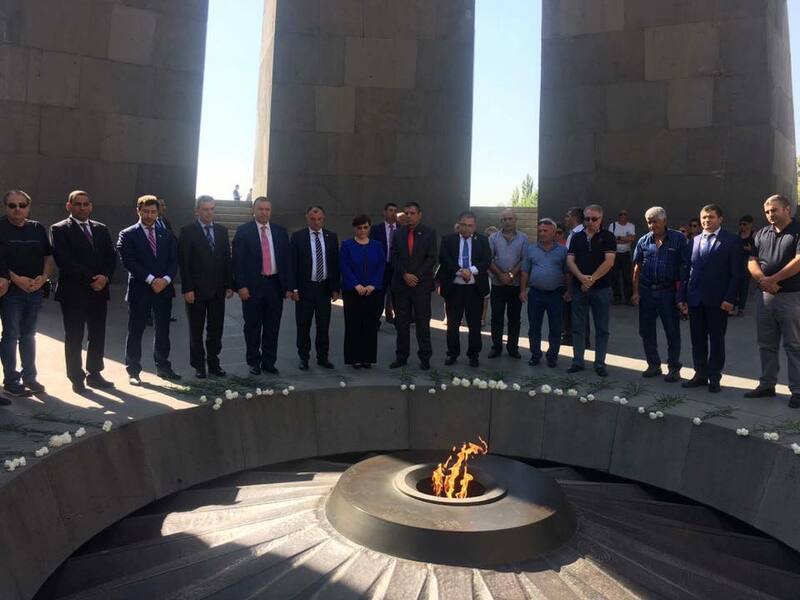 The participants of the вЂњArmenia-DiasporaвЂќ 6th conference headed by Hranush Hakobyan, the Minister of Diaspora of RA, visited the Armenian Genocide Memorial Complex and honored the memory of the Armenian Genocide victims. The delegation was accompanied with Suren Manukyan, Director Designee of AGMI. The Minister Hranush Hakobyan laid a wreath at the Genocide Monument and participants of the conference put flowers at the eternal fire and honored the memory of the innocent martyrs with a minute of silence. All the people who were present sang вЂњCiliciaвЂќ song at the eternal fire. A silver fir was planted in the Ally of Memory by the participants of the Conference. 95th anniversary of Smyrna disaster is in September. 1922 Smyrna disaster was one of the last episodes of Armenian Genocide. During only several days the prosperous city known as the вЂњEast StarвЂќ for its beauty, stopped to exist. The city, which was once the place of Christianity in Asia Minor with an emphasized Christian character was called вЂњGiavur IzmirвЂќ by Muslim population, remained only Turkish. The most part of the Christian civilians were massacred, and the buildings which belonged to them was set to fire and turned to ruins. Armenians had many Christian and educational institutions in Smyrna. Saint Stephan church was unique for its architecture and luxury. The oldest scripts concerning the church are from the 17th century. The church is supposed to be built in the 16th century. Before the disaster of Smyrna in 1922 according to the inscription on marble stones around the main door of the church, the church was rattled from the 1688 earthquake and was rebuilt in 1689. The fire of 1845 caused great damage to Saint Stephan church. It was again renovated by Melqon Eramyan in 1853. 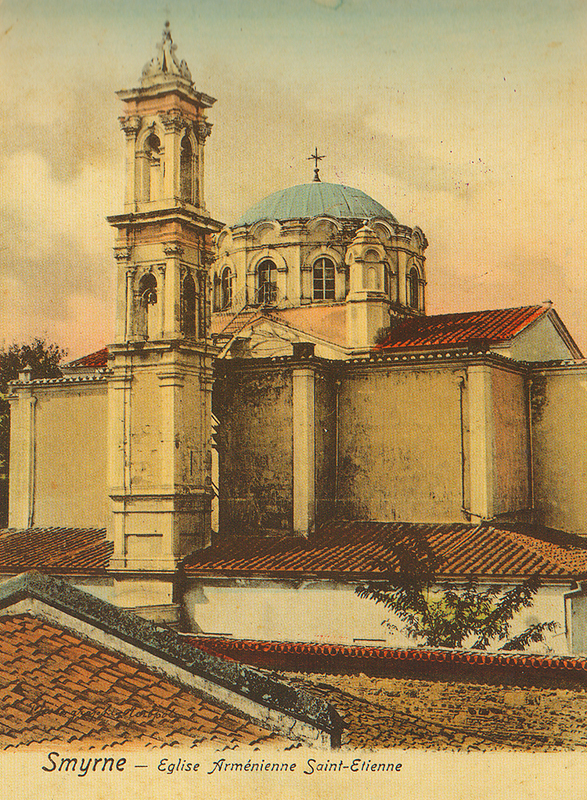 Saint Stephan church was one of the luxurious and biggest buildings of Smyrna. It had seven doors, and the main one was opened only on special occasions. The right side door was the one that was used every day, and was opened day and night for the believers. The church had a luxurious dome, golden altars, marble high cornerstone, high columns, and numerous windows. 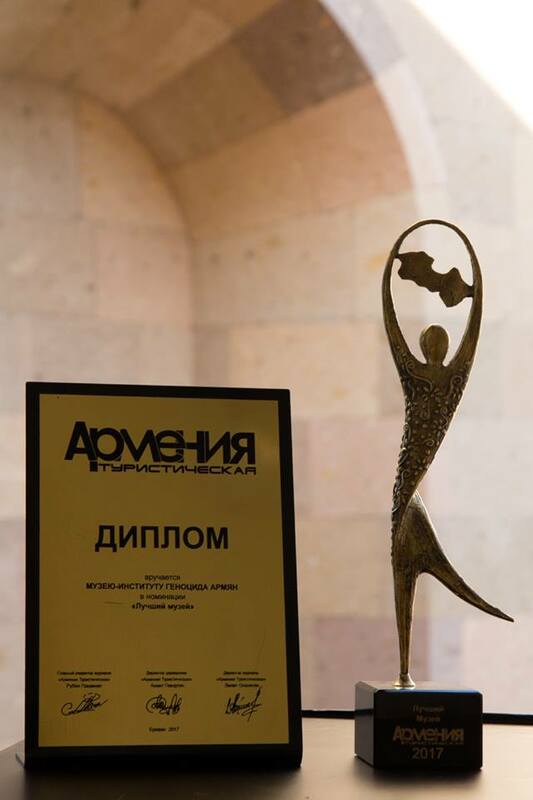 В«РђСЂРјРµРЅРёСЏ РўСѓСЂРёСЃС‚РёС‡РµСЃРєР°СЏВ» magazine has recognized Armenian Genocide Museum as вЂњMuseum of the YearвЂќ. On 9th of September, 12 nominations were presented at the award ceremony of В«РђСЂРјРµРЅРёСЏ РўСѓСЂРёСЃС‚РёС‡РµСЃРєР°СЏ 2017В» 4th Tourism Industry Awards. The winners were awarded by bronze statuettes of Margarita Matulyan. Specialists involved in the tourism sector took part in the voting. The purpose of the event is to develop the tourism sector in Armenia, award the companies recognized as the best by voting, as well as encouraging the more successful projects in the sector. The scientific concept of the new exhibition of Armenian Genocide Museum reopened in April 2015 has been developed and implemented by the staff of the Armenian Genocide Museum-Institute headed by Doctor of Historical Science and Secretary of commission on the coordination of events dedicated to Armenian Genocide Centennial. The interior design of the museum was developed and carried out by Lusine Matevosyan and Christine Abrahamyan. 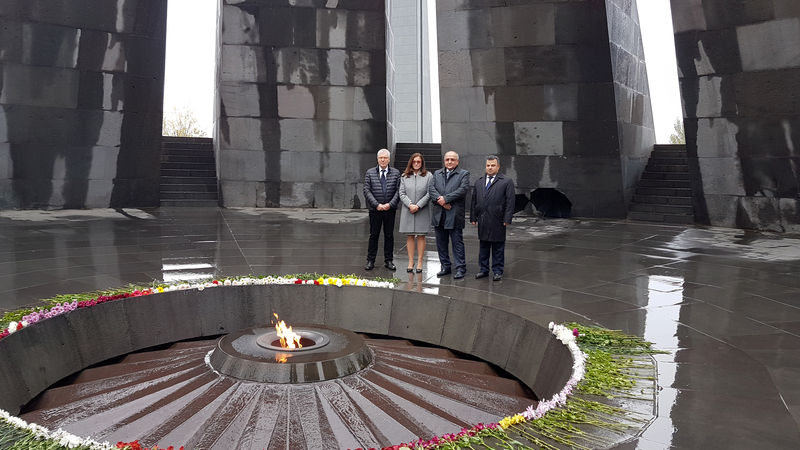 Israeli delegation headed by deputy speaker of the Israeli Knesset, Israel-Armenia Parliamentary Friendship Group Leader Tali Ploskov visited Armenian Genocide Memorial Complex. Tali Ploskov laid a wreath at the Genocide Monument and members of the delegation put flowers at the eternal fire and honored the memory of the innocent martyrs with a minute of silence. The delegation was accompanied with AGMI Acting Director Suren Manukyan who presented to the guests the construction history of the Memorial Complex. The guests also visited the Genocide Museum and got acquainted with the details and episodes of the Armenian Genocide. The guests also left notes in the Memory Book of Honorable Guests. On 31st of August, Deputy Speaker of the People's Representative Council of the Republic of Indonesia Fadli Zon visited Armenian Genocide Memorial Complex accompanied with Ambassador Extraordinary and Plenipotentiary of the Republic of Indonesia to the Republic of Armenia Judy Chrisnand. Mr. Fadli Zon and the accompanied delegation laid flowers at the eternal fire and honored the memory of the innocent martyrs with a minute of silence. The guests also visited the Genocide Museum and got acquainted with the details of the genocide history. After the visit Mr. Fadil Zon and Mr. Judy Chrisnand left their notes in the Memory Book of Honorable Guests. 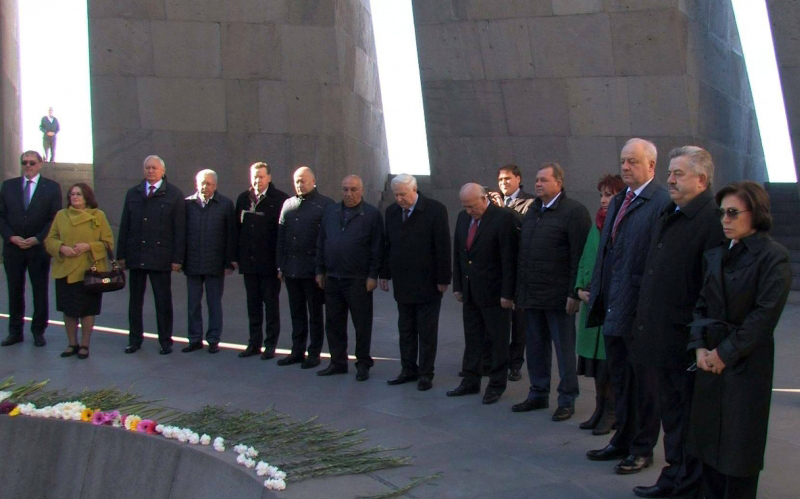 Within an official visit to Armenia Israeli Regional Cooperation Minister Tzachi Hanegbi and the accompanied delegation visited Armenian Genocide Monument. The delegation was accompanied by RA Deputy Minister of Foreign Affairs Armen Papikyan, Honorary Consul of Israel in Armenia Ashot Shahmuradyan, sraeli Ambassador to Armenia Eliezer Yerushalmi and his wife, as well as Deputy Director of Armenian Genocide Museum-Institute Suren Manukyan. Minister Tzachi Hanegbi laid a wreath at the Genocide Monument and members of the accompanied delegation put flowers at the eternal fire and honored the memory of the innocent martyrs with a minute of silence. The guests also paid a visit to the Genocide Museum and got acquainted with the proofs of the greatest crime of 20th century. 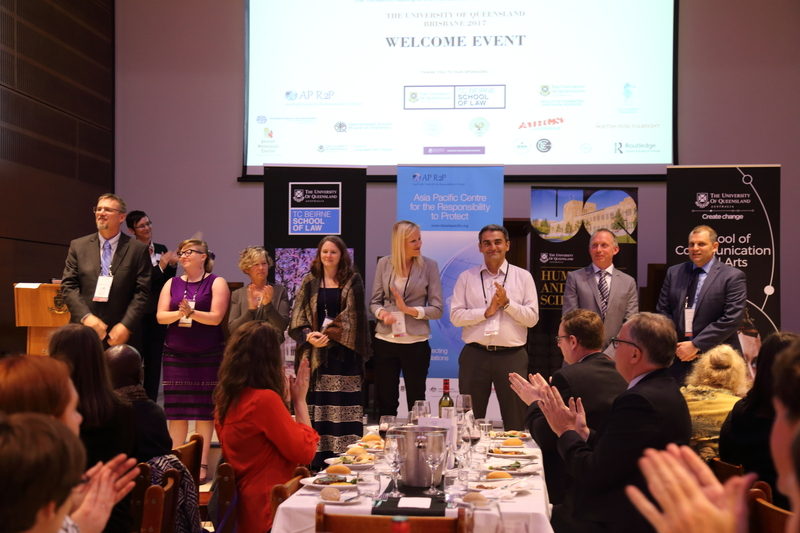 During the 13th conference of International Association of Genocide Scholars in the University of Queensland in Australian city of Brisbane Henry Theriault was elected President of the International Association of Genocide Scholars, Vice Presidents; Adam Muller (Canada, Manitoba University) and Melanie OвЂ™brien (Australia, University of Queensland), board members; Hollie Brehm (USA, Ohio State University), Sara Brown (USA, Shoa Foundation), Hilary Earl (Canada, Nipissing University), Christina Gudehus (Germany, Ruhr-Bohum University), Suren Manukayan (Armenian, Armenian Genocide Museum-Institute), and Andrew Woolford (Canada, Manitoba University). The IAGS was founded in 1994 and is the largest organization uniting genocide scholars in the world. In 8-12 July 2015 Yerevan hosted the 12th conference of IAGS. Alevi Hasan Dvin living in Germany handed to Armenian Genocide Museum a mirror, which was appeared near his grandfather in 1915. Hasan was born in historical Yerznka. 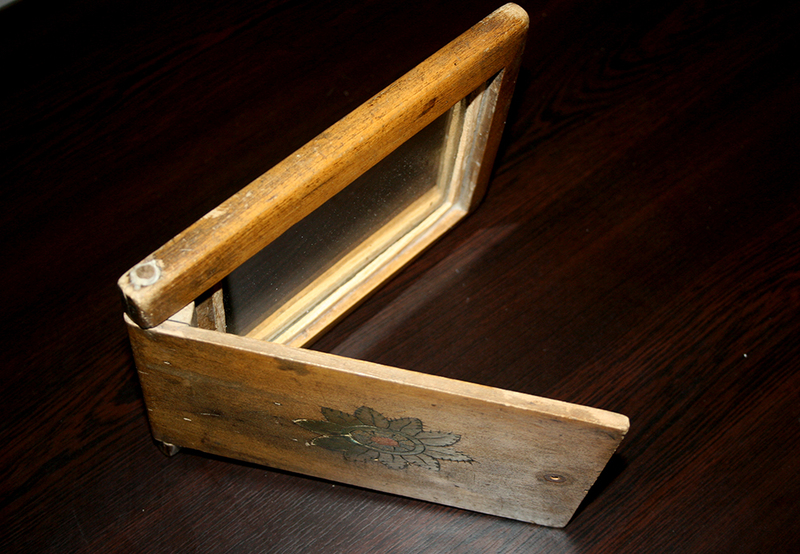 The mirror with a wooden case was given to HasanвЂ™s grandfather by his Armenian neighbors during the deportation and atrocities against the Armenians hoping that one day they would be able to take their belongings back. Unfortunately, as it is known Yerznka is one of those most suffered regions from the Turkish atrocities. Almost all the Armenians of Yerznka were deported and brutally killed. The intellectuals of the place were also arrested and shot dead. 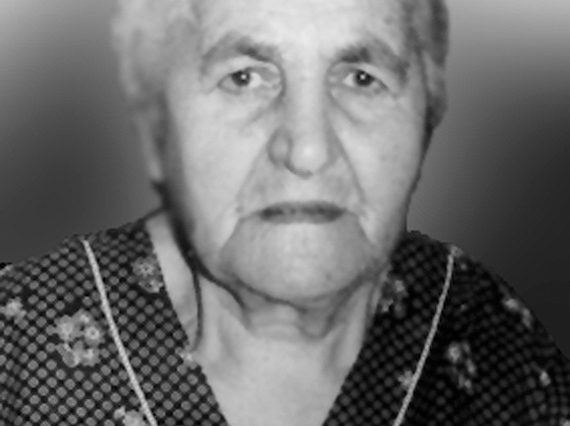 "I would not even wish my enemy see what I saw those days"
Shogher TonoyanвЂ™s story begins in 1915 on the day of the Feast of Vardavar, when massacre started in their village. First they looted their village, took away the cattle, then gathered all the men, seized the girls and young women and led away. Both the elderly and children were burned in stables. 60 of her relatives were burnt, and only she and her brother suvived. On the road of exile they met the group of Andranik, and headed to Persia, Khoy, Nakhchivan, Karabakh and Kapan вЂ¦ In 1922 they reached the village of Katnahbyur of Talin region where Shogher married Grigor Tonoyan from Sasun and gave birth to nine children: Ahavni, Vardush, Gulnaz, Mkrtich, Sarkis, Vachagan, Hreghen, Anahit, Shushik. Within the circle of his official visit to Armenia by an invitation from RA President Serzh Sargsyan Tajikistan President Emomali Rahmon visited Armenian Genocide Memorial Complex. 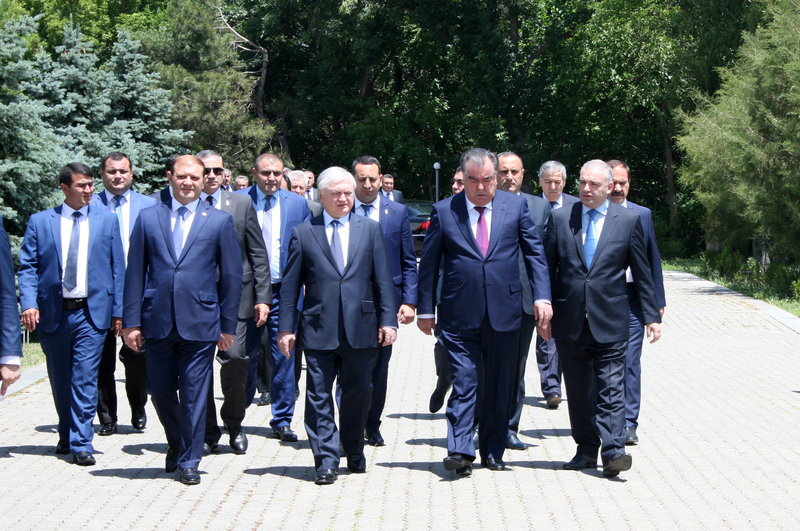 Emomali Rahmon was accompanied with RA Foreign Minister Edward Nalbandyan, Mayor of Yerevan Taron Margaryan, and AGMI Director Hayk Demoyan, who presented to the guest the history of Genocide Monument construction. 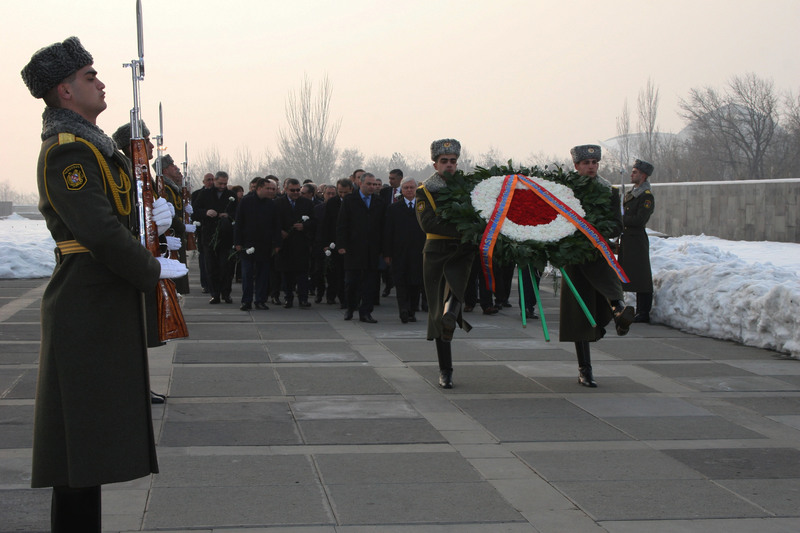 President of Tajikistan laid a wreath at the Genocide Monument and the members of the delegation put flowers at the eternal fire and honored the memory of the innocent martyrs with a minute of silence. Today Foreign Minister of Estonia Sven Mixer visited Armenian Genocide Memorial Complex accompanied with Deputy Foreign Minister of Armenia Karen Nazaryan and RA Ambassador to Estonia Tigran Mkrtchyan. 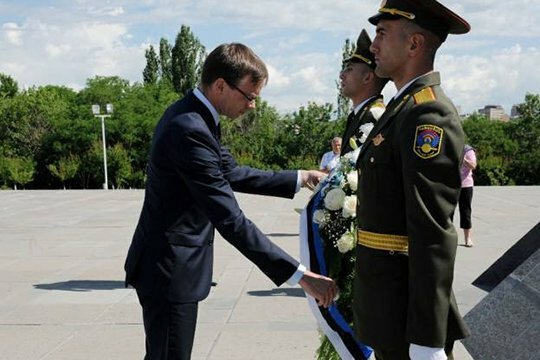 Estonian Foreign Minister laid a wreath at the Genocide Monument and put flowers at the eternal fire and honored the memory of the innocent martyrs with a minute of silence. Director of Armenian Genocide Museum-Institute Hayk Demoyan presented to the Minister the history of the Genocide Monument construction. 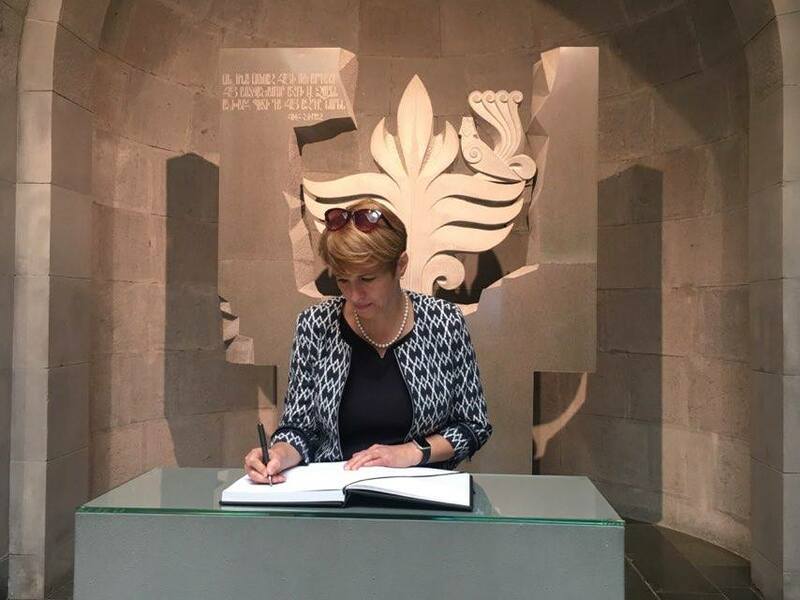 Mayor of Australian city of Willoughby Gail Giles-Gidney visited Armenian Genocide Memorial Complex accompanied with Head of Armenian Diocesan Council of Australia and New Zealand and Head of Yerevan Municipal Foreign Relations Department. Members of the delegation made a tour in the Genocide Museum and got acquainted with the facts of Armenian Genocide and the history of Australian humanitarian aid. At the end of the visit Madam Gail Giles-Gidney left a note in the Memory Book of Honorable Guests. 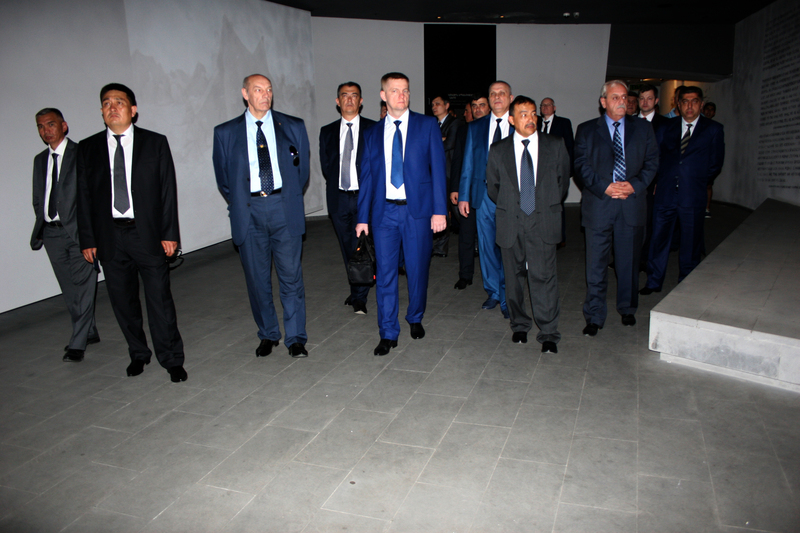 CIS Frontier Troops Headquarters visited Armenian Genocide Memorial Complex. Members of the delegation put flowers at the eternal fire and honored the memory of the innocent martyrs with a minute of silence. Guests of the CIS countries also had a tour in the Genocide Museum and got acquainted with the tragic facts of the Armenian Genocide. At the end of the visit members of the delegation left a note in the Memory Book of Honorable Guests. On 2nd of June, Head of Vatican Secret Archives and Apostolic Library Monsignor Jean-Louis BruguГЁs and professor of church law at the Pontifical Oriental Institute Father Georges-Henri Ruisen visited Armenian Genocide Memorial Complex. They laid flowers at the eternal fire and honored the memory of the innocent martyrs with a minute of silence. The Vatican delegation also made a tour in the Genocide Museum and got acquainted with the tragic episodes of the Armenian Genocide. Monsignor Jean-Louis BruguГЁs and Father Georges-Henri Ruisen left notes in the Memory Book of Honorable Guests. Director of Armenian Genocide Museum-Institute Hayk Demoyan presented to the guests the English edition of вЂњArmenian Genocide: Front page coverage in the world pressвЂќ and "Fridtjof Nansen" gold medals of gratitude for their contribution to the study and recognition of the Armenian Genocide. Chairman of the largest cultural institution in Germany; Goethe Institute Klaus-Dieter Lehman and his wife visited Armenian Genocide Museum accompanied with German Ambassador to Armenia Mr. Bernhard Matthias Kisler. The put flowers at the eternal fire and honored the memory of the innocent martyrs with a minute of silence. After which the German guests made a tour at the Genocide Museum and got acquainted with the facts of the Armenian Genocide. At the end of the visit Chairman of Goethe Institute Klaus-Dieter Lehman left a note in the Memory Book of Honorable Guests. Director of Armenian Genocide Museum-Institute presented to the guest the English edition of вЂњArmenian Genocide: Front page coverage in the world pressвЂќ and the German edition of вЂњAustria-Hungary and Armenia, 1912-1918 archival documentsвЂќ by Artem Ohanjanyan. Today, вЂњAuroraвЂќ Prize 2017 nominee Fartuun Adan visited Armenian Genocide Museum. 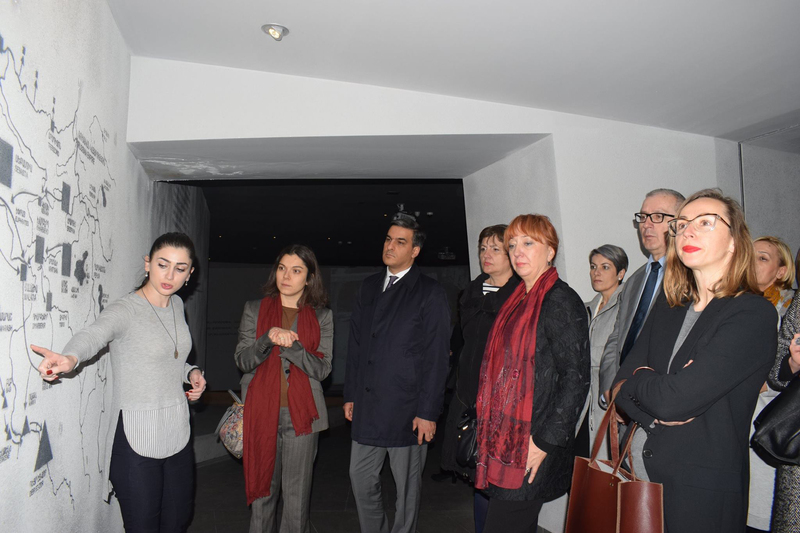 She made a tour at the Genocide Museum accompanied with the deputy director of the museum Lusine Abrahamyan and got acquainted with the facts and episodes of the Armenian Genocide. Fartuun Adan also visited the temporary exhibition of the museum, where an exhibition dedicated to Aurora Martiganian has been opened. After the touching tour in the museum Fartuun Adan expressed her thanks to the museum staff and left a note in the Memory Book of Honorable Guests. On 22 of May, Brandenburg regional Minister of Science, Research and Culture Martina MГјnch visited Armenian Genocide Monument. 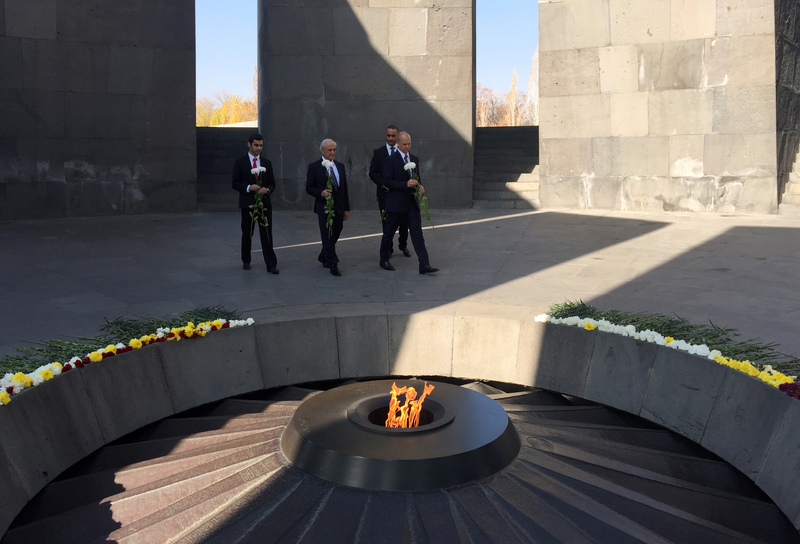 Doctor Martina MГјnch and German Ambassador to Armenia laid a wreath at the Genocide Monument and put flowers at the eternal fire and honored the memory of the innocent martyrs with a minute of silence. Brandenburg regional Minister of Science, Research and Culture also visited the Genocide Museum and got acquainted with the exhibition and the facts of the Armenian Genocide. 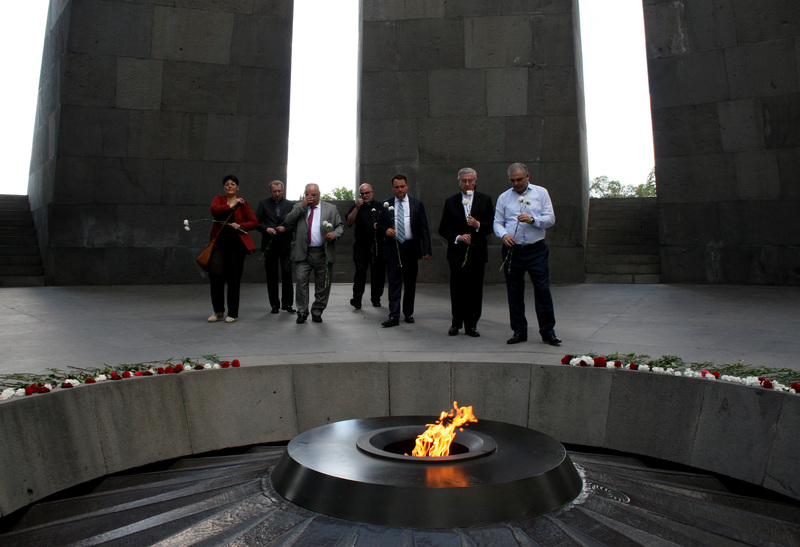 Today, вЂњAuroraвЂќ prize nominee Dr. Tom Catina visited Armenian Genocide Monument. Dr. Catina laid flowers at the eternal fire and honored the memory of the innocent martyrs with a minute of silence. Tom Catina also visited the Genocide Museum and got acquainted with the proofs and facts of the Armenian Genocide. Dr. Catina also visited the temporary exhibition of the museum, where an exhibition dedicated to Aurora Martiganian has been opened. AGMI Director Hayk Demoyan presented to Sudanese humanitarian doctor the life story of the brave Armenian woman who had survived those crimes and passed her all life trying to heal the painful consequences of that tragedy. 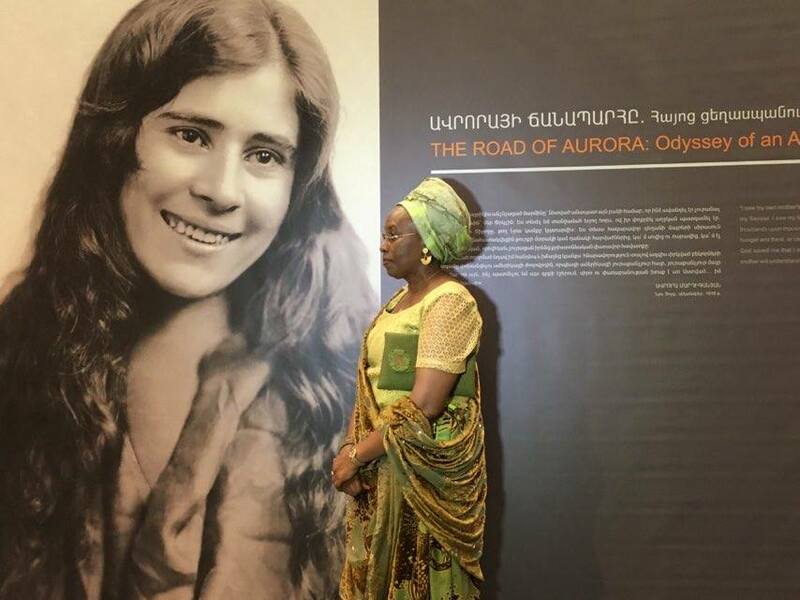 On 20th of May, the winner of вЂњAurora PrizeвЂќ Margaret Barankitseh visited Armenian Genocide Museum. She laid flowers at the eternal fire and honored the memory of the innocent martyrs with a minute of silence. AGMI Director Hayk Demoyan presented to Mrs. Barankitseh the history of the Genocide Monument and the Memory wall where on the one side the names of the Armneian populated cities of Eastern Armenia are engraved and the other side contains the jars filled with soil brought from the graves of those foreign political figures and intellectuals who raised their voices in protest against the genocide perpetrated the Armenians by the Turks. Margaret Barankitseh planted a fir in the Memory Alley of the Genocide Monument. After which Margaret Barankitseh visited the Genocide Museum and got acquainted with crimes and tragic consequences committed against humanity a hundred years ago. During his official visit to Yerevan Governor of Saint Petersburg Georgy Poltavchenko and the visited Tsitsernakaberd Memorial Complex accompanied with Deputy Mayors of Yerevan Kamo Areyan and David Ohanian, and Russian Ambassador to Armenia Ivan Volynkin. The guests were welcomed by AGMI Deputy Director Suren Manukyan. Saint Petersburg Governor laid a wreath at the Genocide Monument and members of the accompanying delegation put flowers at the eternal fire and honored the memory of the innocent martyrs with a minute of silence. The photo was published in the second issue of В«National GeographicВ» magazine in 1919, attached to the article of Meynard Ouen Williams. The little heroes of the photo, the oldest of whom is only 12 years old, had reached Van through different hardships without the permission of the guardians of Artemid. This photo was definitely taken soon after the heroic defence of Van in 1915, and later published in an American periodical. вЂњThey had come to Hambardzumiants, governor of Van, with wooden rifles asking for real ones, because they were ready to fight till the very end to defend their relatives, some of whom they had already lostВ» - the author of the article wrote. 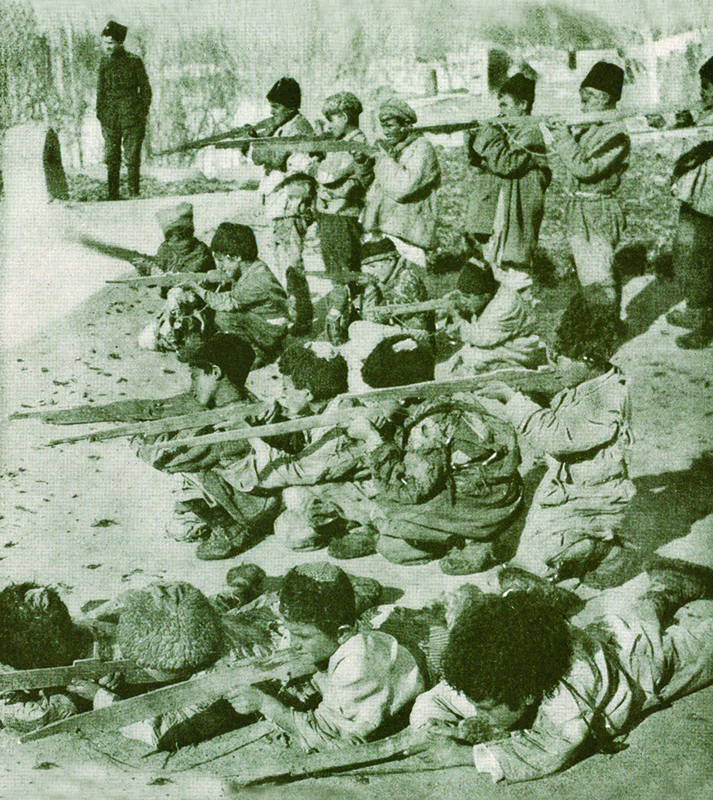 During the years of the Armenian Genocide a number of self-defense fights took place in different town of West Armenia. The fierce fightings between Armenians and Turkish soldiers in Van, which started in 7 April and lasted till 6 May 1915, ended with victory. The self-defense battle of Van, which was distinguished for its perfect organization, was the longest and the most dramatic one. The Armenians of Van were fighting with all their power: women and girls, elderly and children, all of them had become participants of the bloody battles realizing the importance of defending their own homeland and own dignity. 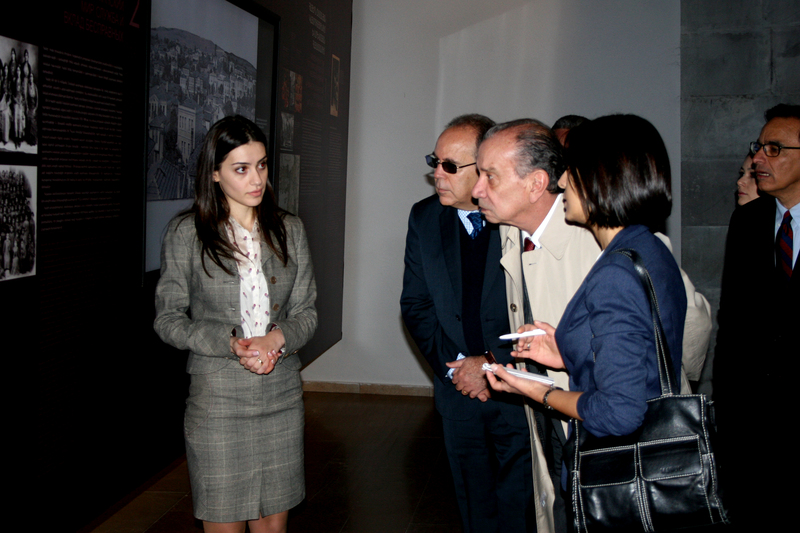 In 29 of April, Lebanese Minister of Planning Michael Pharaon visited Armenian Genocide Memorial Complex. Mr. and Mrs. Pharaon and the accompanying delegation laid a wreath at the Genocide Memorial and honored the memory of the innocent martyrs with a minute of silence. The Lebanese Minister also visited the Genocide Museum and got acquainted with the historical proofs and episodes of the Armenian Genocide. Michael Pharaon also left a note in the Memory Book of Honorable Guests. 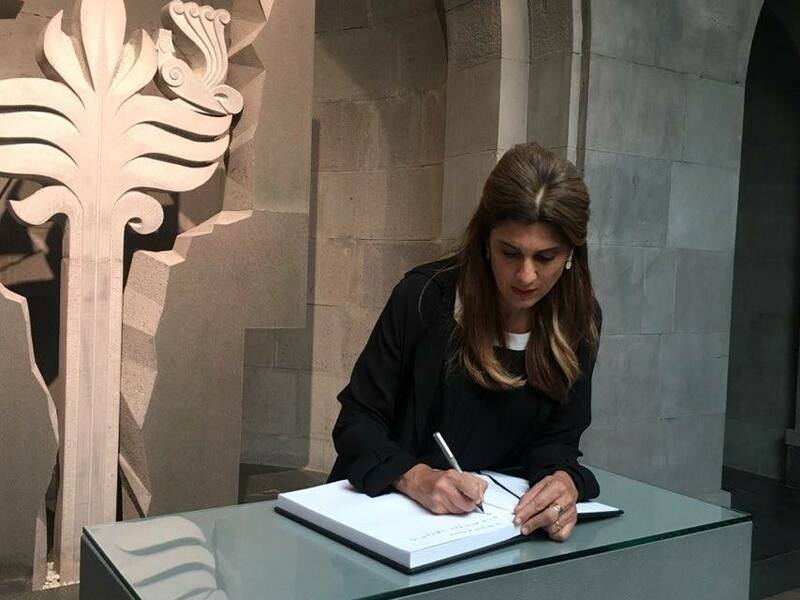 Today, Princess of Jordan Dina Mired visited Tsitsernakaberd Memorial Complex. Her Majesty laid flowers at the eternal fire and honored the memory of the innocent martyrs with a minute of silence. Madam Dina Mired also visited The Genocide Museum and got acquainted with the proofs and facts of the Armenian Genocide. Jordan princess left a note in the Memory Book of Honorable Guests, after which she planted a fir in the Memory Alley of the Memorial Complex. Today the annual flower collecting activity took place at Armenian Genocide Memorial Complex. The humbled flowers at the eternal fire on the occasion of 24th April were collected to have a second life. With the initiative of Foundation for the Preservation of Wildlife and Cultural Assets, since 2010the humbled flowers at Armenian Genocide Monument have been gathered and used to undergo a special processing. Flower stalks are switches off the petals: compost is derived from the first part and the flower petals are used in preparing of recycled handmade paper. The compost is used to enrich the soil of Memory Alley at Tsitsernakaberd Memorial Complex, and the handmade papers for making letters of appreciation and cards. Using special technology 40 sheet of paper is made out of one kilogram flower, which is called flower-paper. This event serves to give a вЂњsecond lifeвЂќ to the flower by recycling it by special treatment and use it again in another form. On 25th April, the Czech Parliament recognized the Armenian Genocide. The resolution passed with 104 votes. The resolution reads: вЂњThe Chamber of Deputies of the Parliament of the Czech Republic condemns the crimes against humanity carried out by the Nazis during the Second World War on the Jewish, Roma and Slavic populations in the controlled territories, the genocide of Armenians and other national and religious minorities in the Ottoman Empire during World War I, as well as genocidal acts committed in other parts of the globe, and calls on the international community to effectively halt human and civilian rights violations in the world as well as resolve disputes through peaceful meansвЂ¦вЂќ. 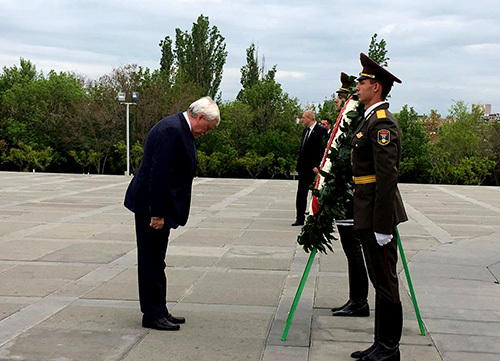 Earlier President Milos Zeman also commemorated the 102th anniversary of the Armenian Genocide and expressed his support to the Armenian community of Czech Republic. On 25th of April, within the circle of an official visit to Armenia Indian Vice President Muhammad Hamid Ansari visited the Armenian Genocide Memorial Complex accompanied with RA Foreign Minister Edward Nalbandyan. Indian Vice President laid a wreath at the Genocide Monument and near the eternal fire honored the memory of the innocent martyrs with a minute of silence. Muhammad Hamid Ansari also visited the genocide museum and got acquainted with the historical proofs and episodes of the Armenian Genocide. The Indian Vice President left a note in the Memory Book of Honorable Guests. Today is the remembrance day of the martyrs of the Armenian Genocide, the 102nd anniversary of Armenian Genocide. 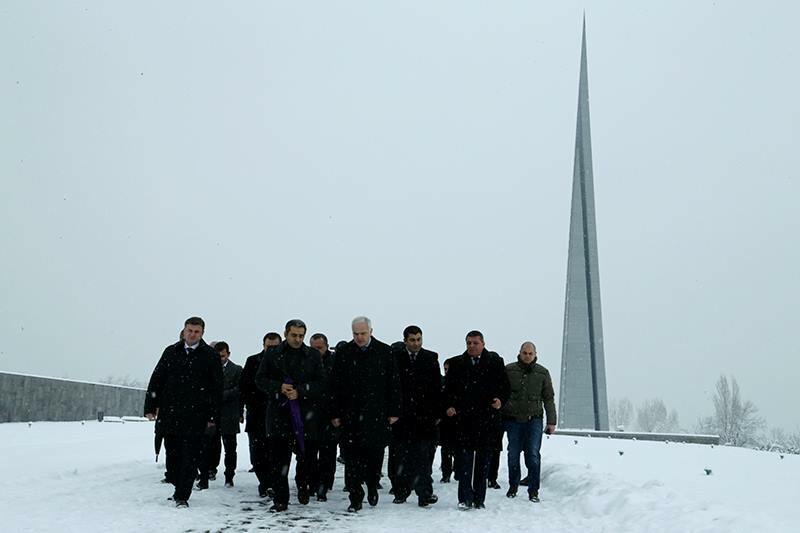 Every year on April 24, hundreds of thousands of people from Armenia, Diaspora, as well as, foreigners visit Tsitsernakaberd Memorial Complex to lay flowers at the eternal fire and honor the memory of the innocent martyrs. On April 24, commemoration ceremonies are held in every part of Armenia and Diaspora. Protest calls are raised against the Turkish denial policy and messages to the international community to recognize the greatest crime of the 20th century. Liturgy is hosted at all dioceses of the Armenian Apostolic Church. In 1920вЂ™s April 24 was marked as the commemoration day of the most tragic page of the Armenian History. Today a new temporary exhibition was opened at Armenian Genocide Museum. The first visitors of the new exhibition were RA President Serzh Sargsyan with the First Lady Rita Sargsyan, RA Prime Minister Karen Karapetyan, RA National Assembly Speaker Galust Sahakyan, and high-ranking officials. The exhibition includes exhibits and samples 25th anniversary of the Independence of Armenia and the 50th anniversary of the construction of the Genocide Monument. The exhibition also includes unique original units acquired by AGMI in the past year. RA President Serzh Sargsyan, His Holiness Karekin II, Catholicos of All Armenians, RA Prime Minister Karen Karapetyan, RA Parliament and government members visited Armenian Genocide Memorial Complex. 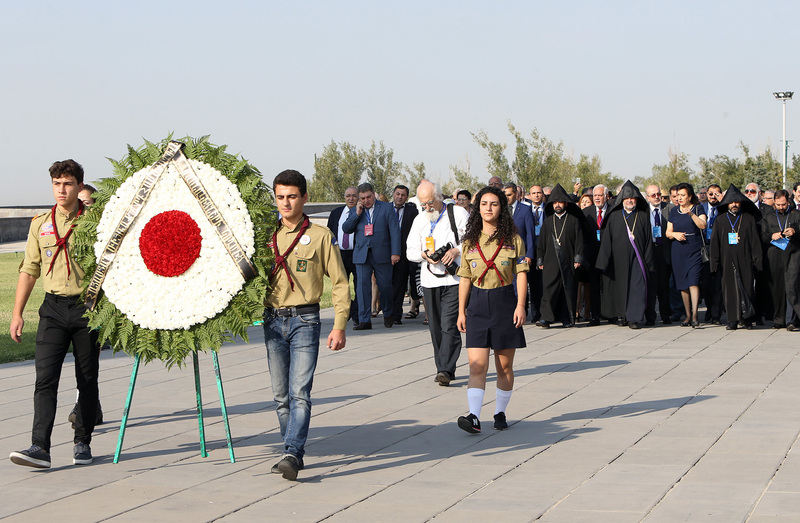 They paid tribute at the eternal fire and His Holiness Karekin II, Catholicos of All Armenians held a memorial service for the peace of souls of the Armenian Genocide victims. Legislative and executive representatives, top military officers, politicians, intellectuals, heads of diplomatic missions accredited in Armenia, and members of non-governmental organizations also paid tribute and commemorated the memory of the innocent martyrs. RA President and the accompanied delegation also visited the museum, where Director of Armenian Genocide Museum-Institute Hayk Demoyan presented the new opened temporary exhibition dedicated to the 25th anniversary of the Independence of Armenia and the 50th anniversary of the construction of the Genocide Monument. According to the committee, commemoration ceremonies were intended to be held from April 11th through the 18th, but due to the Armenian PatriarchвЂ™s illness at the time, the date was delayed by one day. Bishop Mesrop Naroian held a liturgy for the victims of the Armenian Genocide from April 15th to the 25th in St. Trinity church of Bera district of Constantinople. Today, a press conference took place at the conference hall of the Armenian Genocide Museum-Institute. During the meeting AGMI Director Hayk Demoyan presented the works and achievements of the museum-institute in the past ten years, as well as, the upcoming projects. 2017 marks the 50th anniversary of the Genocide Memorial Construction. AGMI is planning some events and a temporary exhibition dedicated to this occasion. вЂњThis year we are going to present a temporary exhibition which presents the chronology of the construction of Armenian Genocide Monument; historical photographs during construction works, few samples of how individuals participate in construction work, and samples of photographs printed on different carriers. Looking back we can see the great mission it had on all Armenians in the last fifty yearsвЂќ, said AGMI Director Hayk Demoyan. "Song can become a weapon in the fight for freedom". In April 12, "Liderhorn" choir of Norwegian Bergen city visited Armenian Genocide Memorial Complex. The Norwegian choir performed a couple of songs near the Monument. Swedish, Norwegian, Chilean and African spiritual songs have been voiced. The choir has also prepared some Armenian songs for their concert in Armenia. After the performance the Norwegian guests laid flowers at the eternal fire and honored the memory of the innocent martyrs with a minute of silence. At the end of the visit "Liderhorn" choir singers presented to AGMI Deputy Director Suren Manukyan an illustrated catalog about their hometown Bergen. An event dedicated to the Armenian Genocide was held a few days ago in the US Congress building of Washington. It was organized by the Armenian Assembly of America, the Congressional Caucus on Armenian issues, the Armenian Embassy in USA, Representative of the Republic of Nagorno Karabakh and the Armenian National Committee In America. A number of American congressmen, Heads of the Armenian Community and Armenian organizations, as well as diplomats attended the Event. Hayk Demoyan, the Director of AGMI stressed the importance of maintaining the history or the Armenian Genocide in his speech. 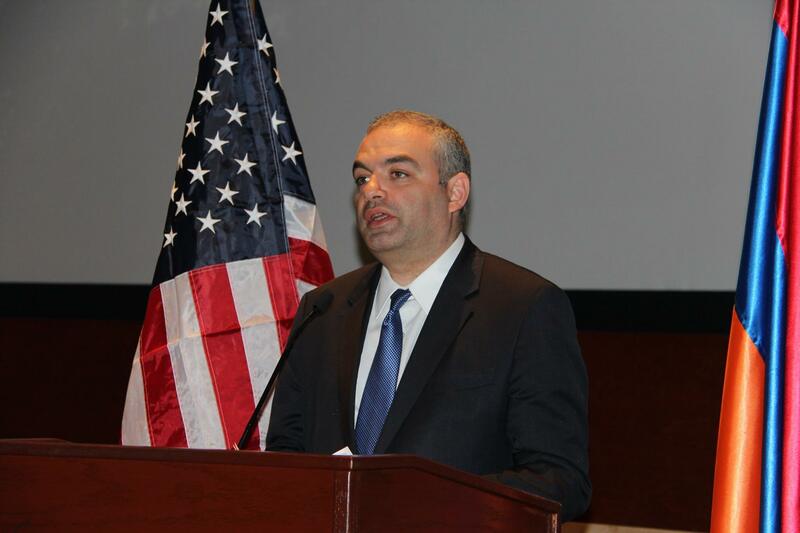 вЂњCommitment of Preventing Genocide is a constant anxiety, and it is very important for Armenians, that America share our values to confront the threat of violations of human rights,вЂќ mentioned AGMI director. The opening of the Armenian Genocide Library of the Armenian National Institute was held on April 5 in Washington. Although the books presented here do not reflect Armenian history and national character, but they provide detailed information on the Armenian Genocide, the most tragic event in the Armenian history. Hayk Demoyan, Doctor of Historical Sciences and the director of the Armenian Genocide Museum-Institute also attended the library opening ceremony. He welcomed the opening of the library and the cooperation prospect with Armenia. 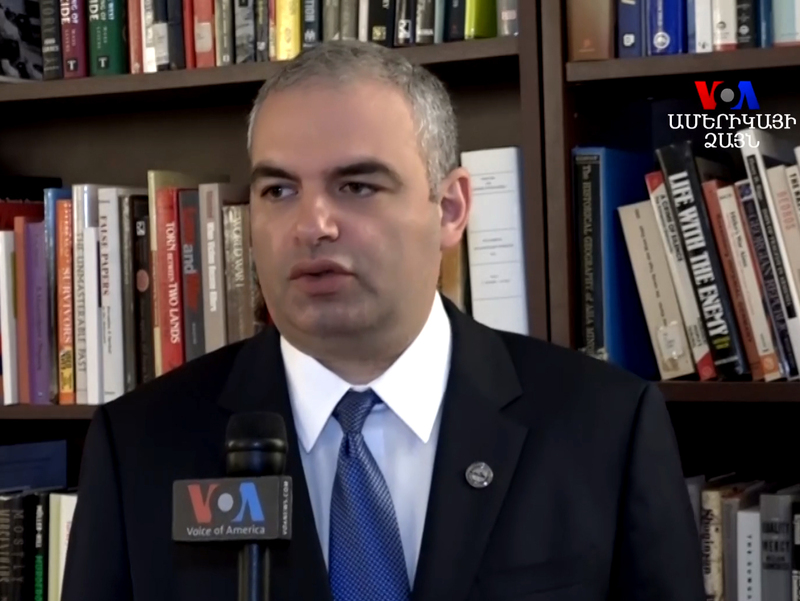 вЂњThe opening of the Armenian information center in Washington is a very important event. Firstly the establishment of such center in the US capital is already a serious achievement, and secondly this center will become a place for meetings and discussions, as well as a center for organizing coordinated activities. 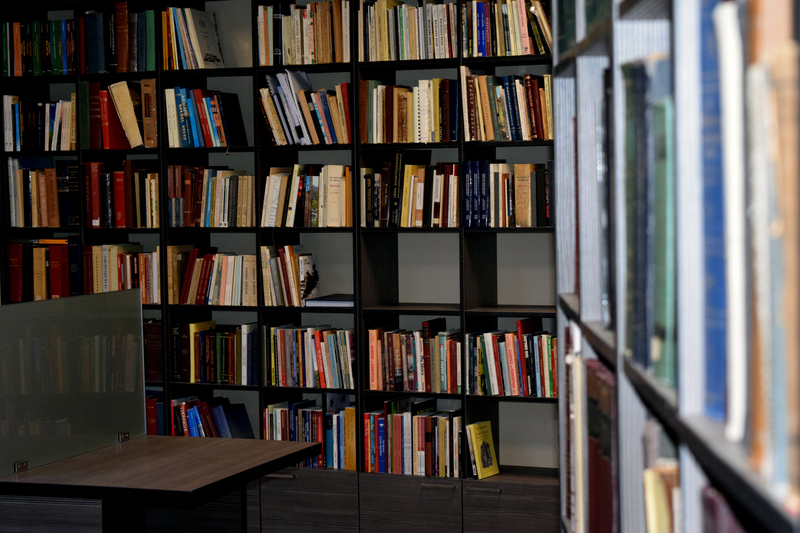 This is more than a library or information center,вЂќ Hayk Demoyan said. "Armenian Genocide and the European History and Memory"
An article by Hayk Demoyan, Doctor of Historical Sciences, and AGMI director, was published in an English-language collection вЂњEuropean Commemoration:Locating World War I.вЂќ The collection is dedicated to events of World War I. 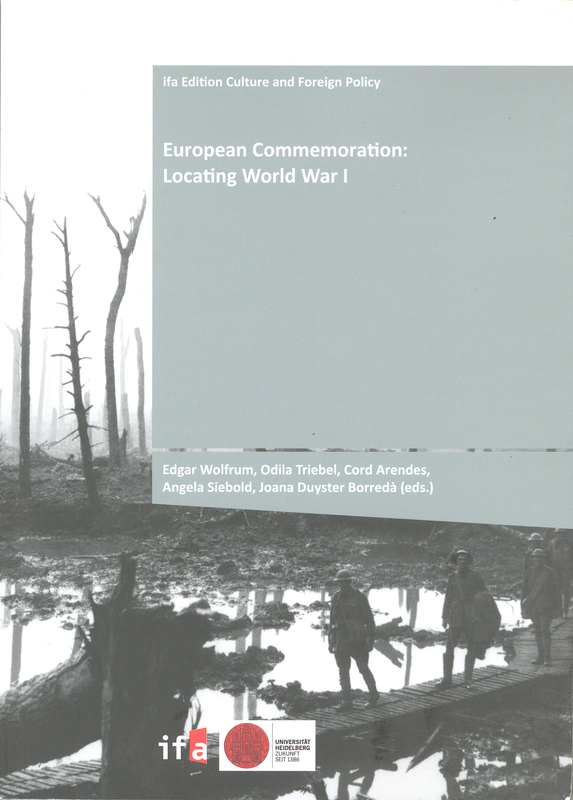 Materials of the collection were first presented during the international conference вЂњEuropean Commemoration вЂ“ 2014вЂќ, dedicated to the centennial of World War I. 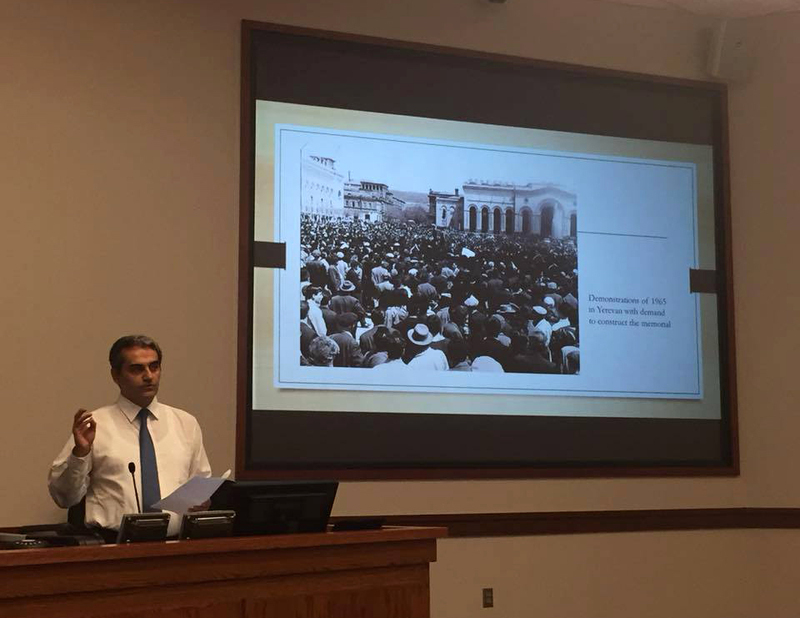 In the article titled вЂњThe Armenian Genocide and the European History and MemoryвЂќ Hayk Demoyan briefly presents the most tragic periods in the history of the Armenian Genocide during World War I based on the European sources, mainly the responses and memories of the European eyewitnesses and diplomats. 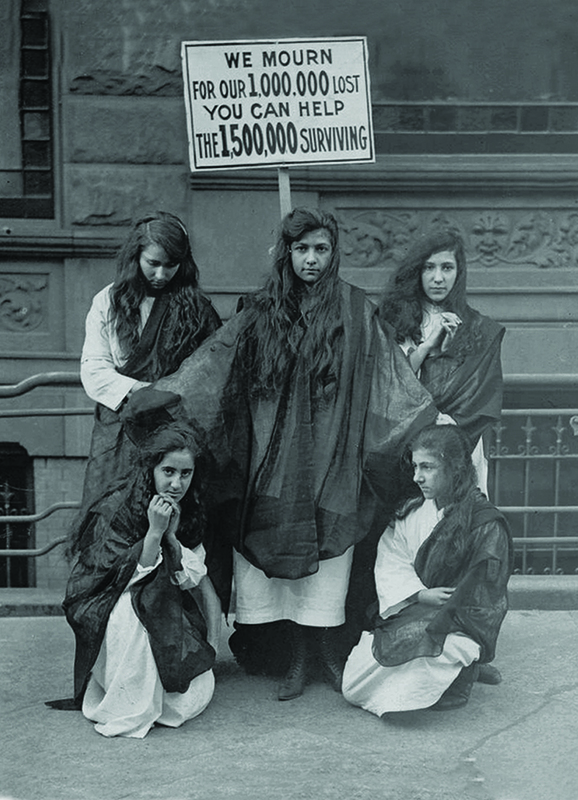 In 1917 representatives of the small Armenian community of New York organized a unique action in one of the city streets, trying to attract public attention to help the Armenians in need. Girls in the images of Mother Armenia and orphans raised a poster with the following note: вЂњWe mourn for our 1,000,000 lost, You can help the 1,500,000 survivingsвЂќ. During and after the Armenian Genocide the US government, Americans citizens, as well as the Armenian community of U.S. put much effort to provide humanitarian aid to the Armenian survivors. Most of the survivors found their shelter in the Middle East, Greece, Caucasus and elsewhere. Together with humanitarian relief organizations established by the U.S. government, local Armenian community was also engaged in those activities in various means. On March 10 within an official visit to Republic of Armenia Greek Foreign Minister Nikos Kotziasn visited Armenian Genocide Monument. The Minister laid a wreath at the Genocide Monument and honored the memory of the innocent martyrs with a minute of silence. After which, along with AGMI Director Hayk Demoyan the Greek Minister visited the Genocide Museum and got acquainted with the tragic episodes and proofs of Armenian Genocide. At the end of the visit Minister Minister Nikos Kotziasn left a note in the Memory Book of Honorable Guests. Today Armenian Genocide Museum-Institute won the prize of RA Government in field of investments in international standards 2016. Director of Armenian Genocide Museum-Institute Hayk Demoyan thanked the organizers for evaluating the work of the museum and mentioned that AGMI works are based on the respect of the memory of Armenian Genocide victims. The award of a number of large and popular Armenian associations is organized by National Institute of Standards in collaboration with Ministry of Economic Development and Investment and National Council of confidence. Today, at Armenian National Center of Aesthetics in cooperation with Armenian Genocide Museum-Institute and Union of Manufacturers and Businessmen of Armenia a temporary exhibition was opened dedicated to the 175th anniversary of famous Armenian benefactor Alexander Mantashyans. The event started with postcard fading, after which Director of Armenian Genocide Museum-Institute presented to the guests the rare collection of historical instruments of ratification of Mantashyants and the Armenian business life of 19-20 centuties, as well. The exhibition includes items and exhibits related to Armenian business life in the Ottoman Empire and Tsarist Russia, such as, postcards, photos, commercial forms, bank securities, theoretical manuals and guides related to Armenian merchants. Within the framework of an official visit to Yerevan Speaker of the State Duma of the RF Federal Assembly (FA) Vyacheslav Volodin visited Armenian Genocide Memorial Complex accompanied with RA National Assembly Deputy Speaker Eduard Sharmazanov. 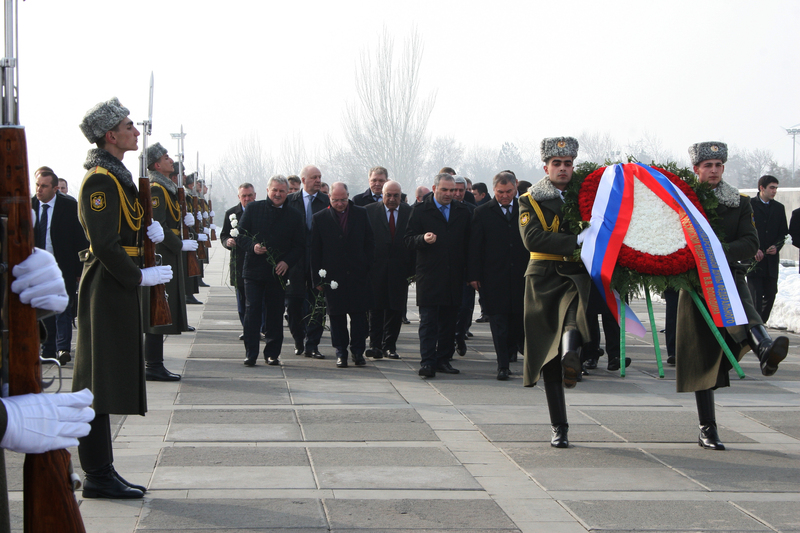 Vyacheslav Volodin laid a wreath at the Genocide Monument and Russian and Armenian parliamentarians put flowers at the eternal fire and honored the memory of the innocent martyrs with a minute of silence. 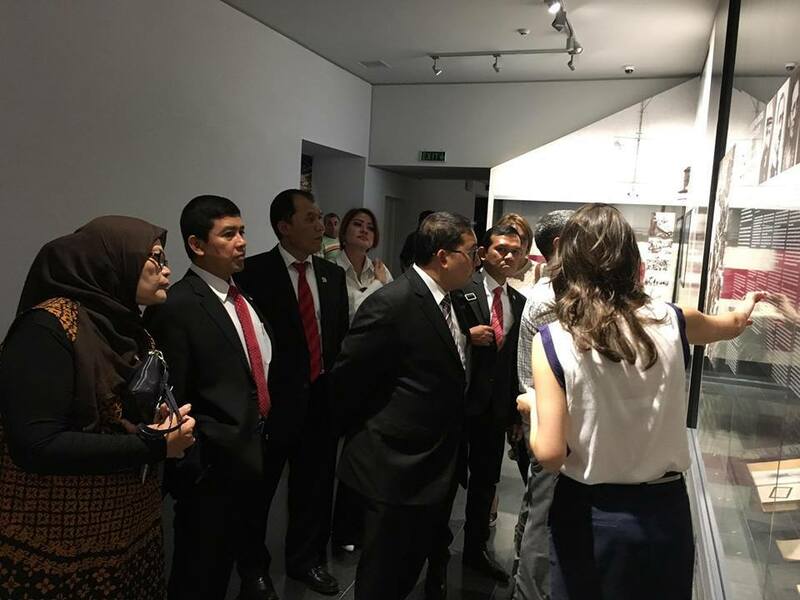 Russian parliamentarians also visited Armenian Genocide Museum and got acquainted with the tragic episodes and proofs of the Armenian Genocide. 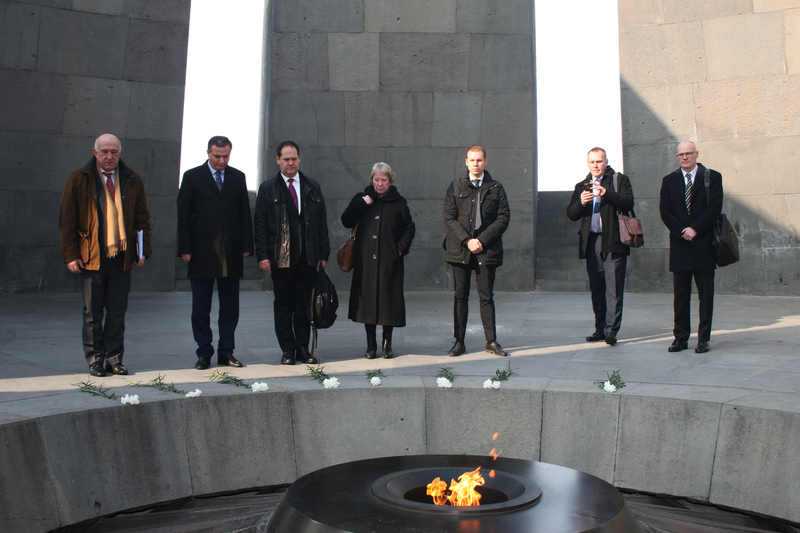 On March 3, RA Foreign Minister and Heads of diplomatic missions abroad visited Armenian Genocide Memorial Complex. RA Diplomats laid a wreath at the Genocide Monument and honored the memory of the innocent martyrs with a minute of silence. During these days the regular meeting of RA Foreign Ministry, Ambassadors Extraordinary and Plenipotentiary of Armenia abroad, permanent representatives of Armenia in international organizations and consuls general are being held. 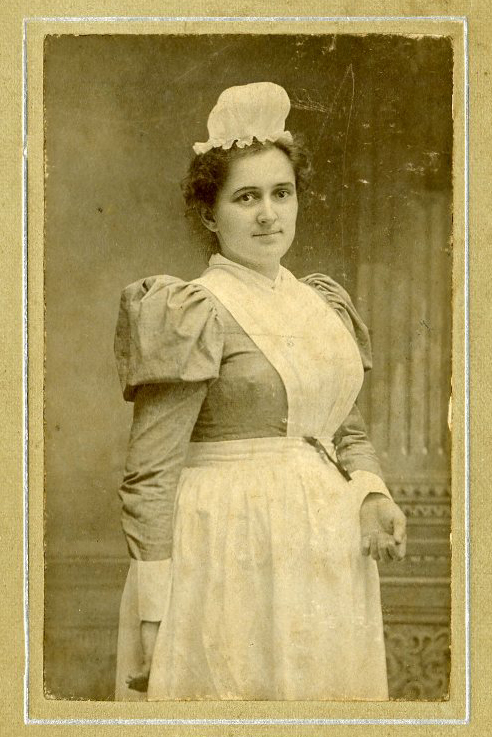 In 1894-1896, Miss Corinna Shattuck an employee of organization of American Council of authorized representatives of foreign missions (OALAKH- American Board of Commissioners for Foreign Missions or ABCFM) performed great work In order to mitigate the massacre horrors of western Armenians. The result of her heroic efforts was that she ensconced and saved the life of the 240 Armenians (60 men and the rest women and children) in the house allocated to her, risking her own live during the massacres at Urfa in 1895. She even did not use the right reserved to herself to move Ayntap preferring to help the Armenians suffered from the massacres. 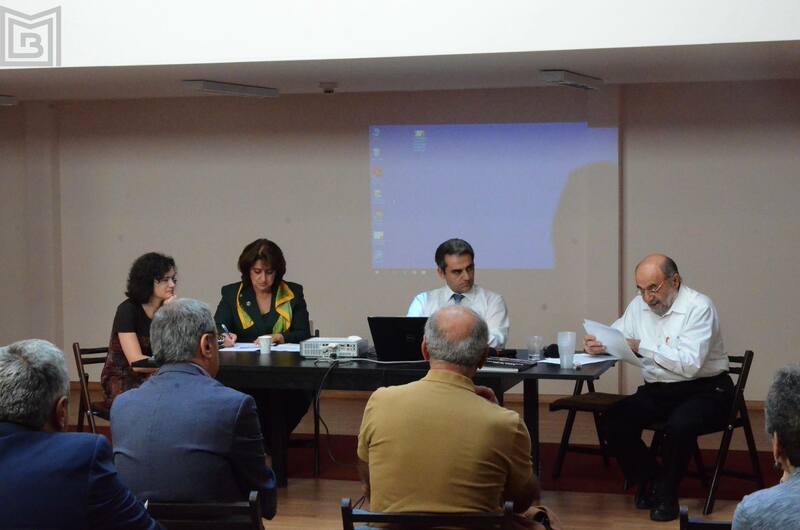 On 10 February, the presentation of 12th volume of archival documentary вЂњMaterials for the history of ARFвЂќ edited by Yervand Pambukian took place in Yerevan. The volume recently has been published in Beirut. The theme of the volume is the Armenian Genocide. The volume includes historical materials of primary sources on the theme of the Armenian Genocide kept in the RAF central archives. 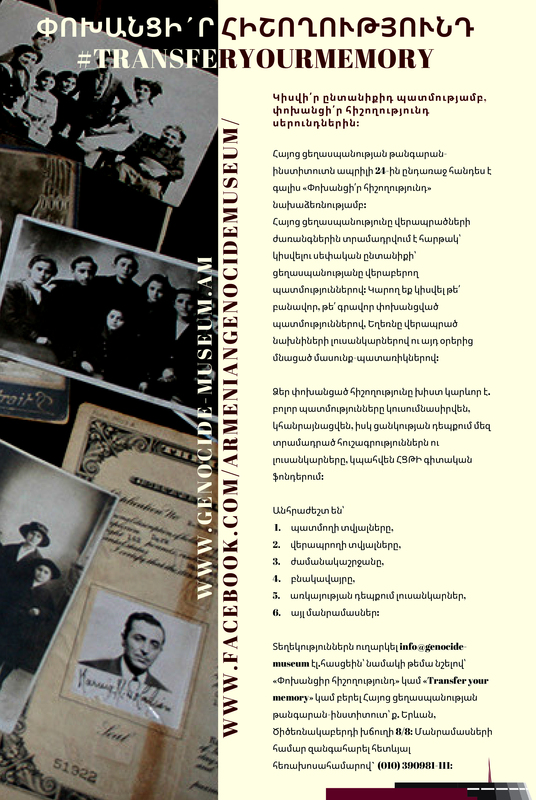 The volume also includes testimonies of genocide survivors collected by Shavarsh Misakyan, who was one of the first who collected and recorded those testimonies about Armenian Genocide. 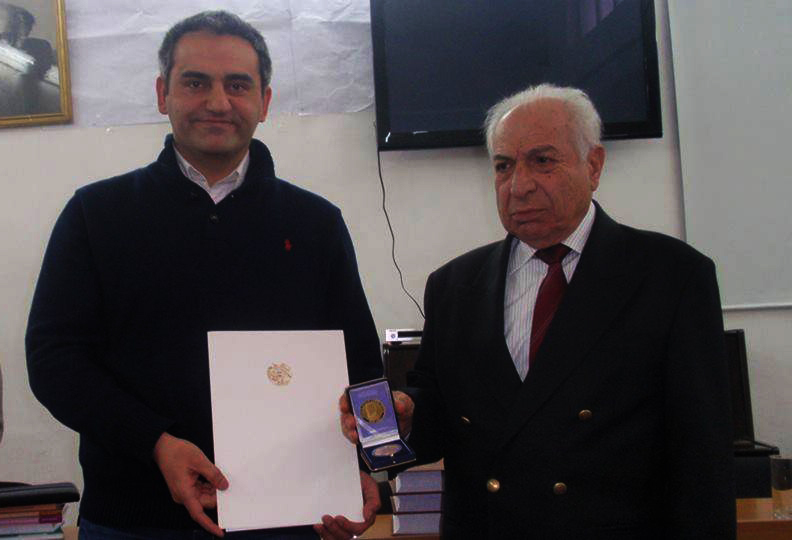 Director of Armenian Genocide Museum-Institute Hayk Demoyan awarded Shahan Gantaharyan; Director and Chief Editor of вЂњAztagвЂќ daily with "Henry Morgenthau" gratitude medal. AGMI highlights and appreciates the editorial staff of вЂњAztagвЂќ daily, particularly the supports of chief editor Shahan Gantaharyan and his participation in coordinating the cooperation of Hayk Demoyan; Secretary of Armenian Genocide 100th anniversary events with the Armenian community of Lebanon. Armenian Genocide Museum-Institute and Armenian daily newspaper вЂњAztagвЂќ published in Lebanon have close collaboration for long years. вЂњAztagвЂќ daily covers the activities of Armenian Genocide Museum-Institute and the information published on its website. Articles of AGMI researchers are also published in вЂњAztagвЂќ exceptional volumes. Today, a delegation headed by Chairman of the Foreign Relations Commission of the Parliament of the Kingdom of Sweden visited Armenian Genocide Memorial Complex. Commission Chairman Kenneth G Forslund and the accompanying delegation put flowers at the eternal fire of the Memorial Complex and honoured the memory of the innocent martyrs with a minute of silence. Swedish parliamentarians also visited Armenian Genocide Museum and got acquainted with proofs, facts and episodes of Armenian Genocide. Devastation caused by the Armenian Genocide was immense not only in physical but also in psychological and spiritual levels. Psychological studies of genocide deal with traumas, psychological and mental characteristics of survivors, different psychological effects of genocide on generations of the survivors and other similar issues. 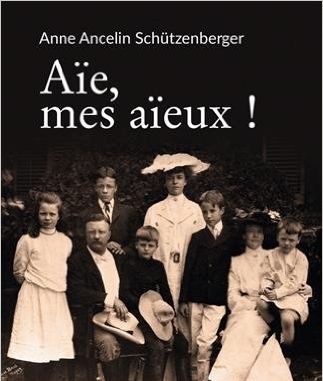 An important observation on an aspect of psychological trauma of genocide was done by French psychologist Anne Ancelin SchГјtzenberger in her book titled вЂњThe Ancestor Syndrome: Transgenerational Psychotherapy and the Hidden Links in the Family TreeвЂќ, first published in 1998. This book is generally focused on the influence of emotional experiences and their transmission through generations. Here Anne SchГјtzenberger creates her own method of therapy, and the main tool of the latter is genosociogram. With the help of genosociogram Anne SchГјtzenberger examines the complex knots of tragic family histories and by highlighting the transgenerational links she offers a method to stop the intergenerational unconscious repetitions. Anne SchГјtzenberger touches upon the psychological trauma of genocide and its penetration in lives of survivors and their descendants. The author views this phenomenon on the example of some psycho-somatic features of the survivors of the Armenian Genocide and their generations through building their genosociograms. Working with family cases she comes across the case of a French woman of Armenian descent-Jacqueline- as transmitted unconscious repetition as well as somatic and neurotic manifestation of trauma caused by the Genocide. This rare photo was taken in 1915/1916 in the surroundings of Ras al-Ayn; a Syrian locality, where the Armenian deportees from the Western Armenia and other places of the Ottoman Empire have been settled. The photo was taken secretly from the second floor of a building near the refugee camp. Probably the photographer tried to be unnoticed realizing that he/she could be severely punished by the Ottoman censorship law, which banned taking photo of the caravans of the deported Armenians and the refugeeвЂ™s concentration camps. During the years of the Genocide the Arabian village of Ras al-Ayn; located on Euphrates, became the cantered refugee camp of the deported Armenians from Sebastia, Diyarbakir and Kharberd, and from Constantinople and Cilicia afterwards. According to the eye witnesses, 500-600 people died daily of cold, hunger or epidemics. In 4 months 3-14 thousand people passed away in Ras al-Ayn, for which the local governor asked not to stop the replacement of the Armenian deportees in that locality. The Armenian Genocide Museum will be closed from Jan. 28 - 30. 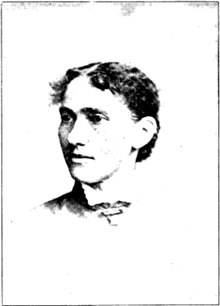 Sara Corning was born in Chegoggin City, in 1872, eight kilometers north of Yarmouth (south-eastern Canada). She joined the American Red Cross during the First World War (1914-1918) and left for the Ottoman Empire as a volunteer to assist the Armenian refugees and orphans rescued from the Turkish massacres. In those days the Canadian media (Toronto World, The Halifax Herald, La Presse and etc.) largely covered the Armenian massacres to make the public aware of the problem. In 1922 Sara signed up for the Near East Relief and left for Smyrna. In September 1922, the Kemalists invaded Smyrna, which was mainly populated by refugees. Sara remembers: вЂњThe area was filled with lot of sick refugees and we had to open a clinic in order to take care of them, but it was soon closed by soldiersвЂќ. 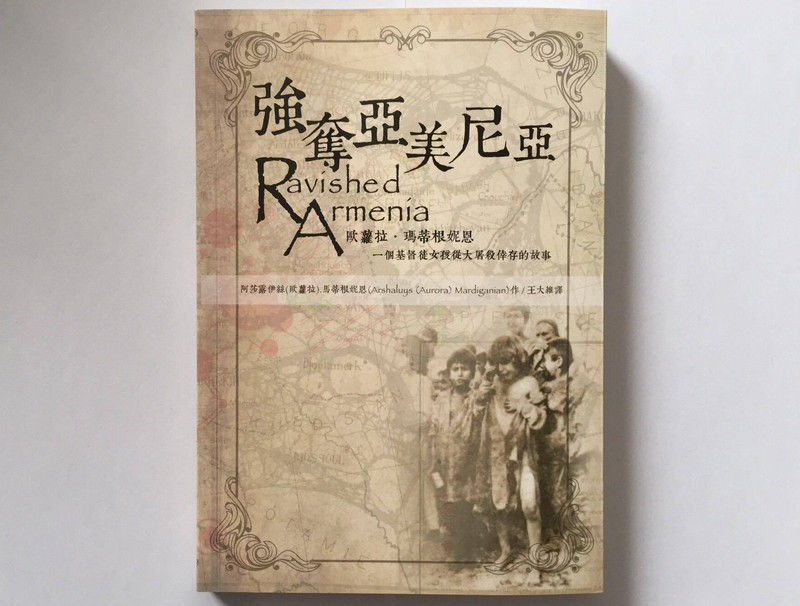 In late 2016, the Chinese edition of вЂњRavished ArmeniaвЂќ had been published in Taiwan. The book is translated and published by David Vang, by the permission of Armenian Genocide Museum-Institute. 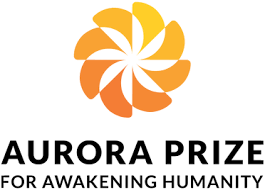 The book presents the memories of Armenian Genocide young survivor Aurora Martiganian (Arshaluys Martikian), the cruel and inhuman hardships she has passed through along with her nation. 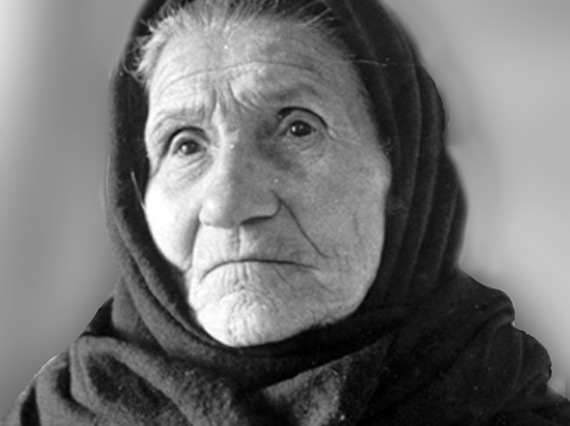 Genocide survivor Mariam Baghdishian comes from the village of Haji-Habibli of Musaler. She says that during the first days of massacres her father was called up to the Ottoman army, and her mother with three young children did not manage to climb the mountain and appeared to be among the deportees. Mariam tells how they were brought to Adana and left without water and bread. Her mother and younger sister died of hunger, and she, along with her other sister, ended up in an orphanage. Istanbul, Shishli, January 19, 2007. 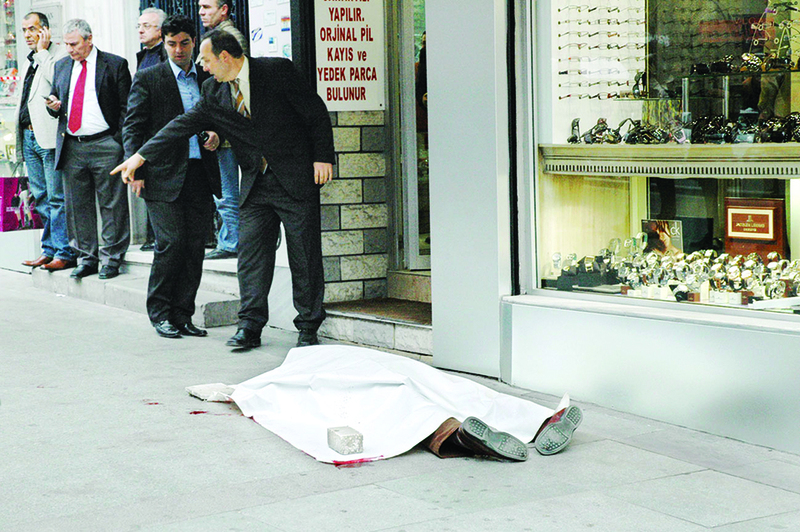 The photo is of the dead body of Hrant Dink; editor of вЂњAgosвЂќ weekly published in Turkey. This murder was the result of nationalist and intolerant atmosphere increasing day by day in Turkey, which is encouraged by the Turkish government. Hrant Dink was the victim of hatred disseminating policy towards Armenians and the policy of denying the Armenian Genocide on state level. This murder gave birth to a new resolution; 1.500.000+1. Hrant Dink was murdered in January 19, 2007, by three firearm shots in the back of his head, in front of вЂњAgosвЂќ editorial office in Shishli. Leaving away the killer had exclaimed вЂњgiaourвЂќ, which gives reason to believe, that the murder was committed on ground of nationalism. Karen Jeppe was born in 1876 in Giling, Denmark. Like his contemporaries, Jeppe first heard about 1894-1896 Armenian massacres from European press. 1902 became a turning point in her life. After listening to a lecture delivered by Danish scholar, humanist Oge Meyer Benediksen, Karen Jeppe becomes member of вЂњDanish Friends of ArmeniansвЂќ humanitarian organization and meets Johannes Lepsius; founder and president of the German Orient Mission with a willing to work with them. Jeppe was not a missioner. Jeppe and Benediksen were deeply convinced that in order to help Armenians in the Ottoman Empire and stimulate their development they have to respect their religion and culture. Jeppe and the leaders of вЂњDanish Friends of ArmeniansвЂќ organization had understood that in order to cooperate with German and American missionary organizations, and local authorities, as well, they must have a support in the Ottoman Empire. Georgian Interior Minister Georgy Mgebrishvili visited Armenian Genocide Memorial Complex with his Armenian colleague RA Chief Police Officer Vladimir Gasparyan. 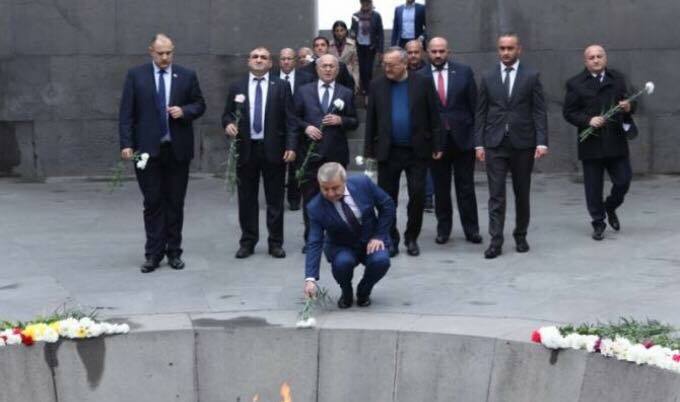 Georgian Interior Minister laid a wreath at the Genocide Monument, after which members of Georgian delegation put flowers at the eternal fire and honored the memory of the innocent martyrs with a minute of silence. AGMI Deputy Director Suren Manukyan presented to the guest the construction history of the Genocide Monument. Than the delegation visited Armenian Genocide Museum and got acquainted with proofs and facts of the Armenian Genocide.